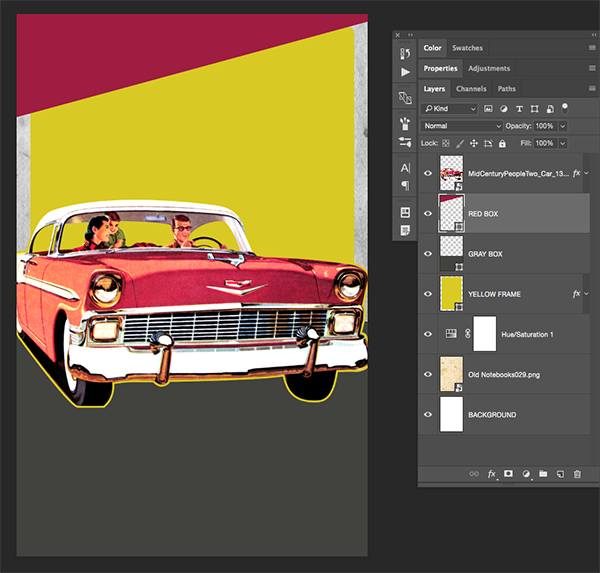 In this design tutorial I will be walking you guys through the design process for creating a vintage looking car poster in Photoshop! 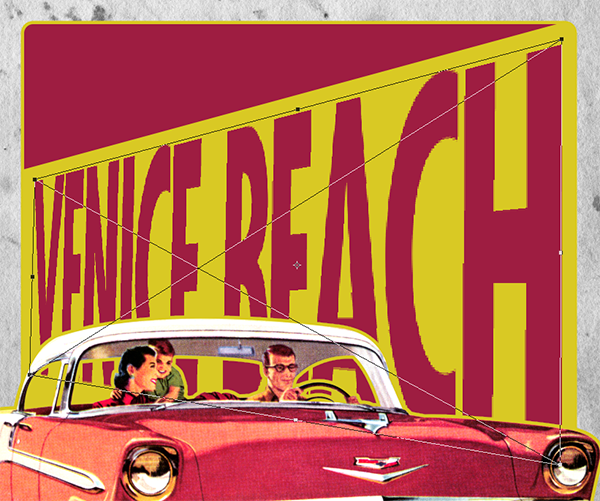 To create our poster we will be using a retro illustration from Piddix, textures from The Beacon Collection and Vector Hut, and some decorative vector elements from Heybing Supply Co. to give you guys a small taste of what’s available in the full bundle. Let’s get started! This freebie pack includes an assortment of textures, vectors, and illustrations that we will be using to create our vintage car poster. 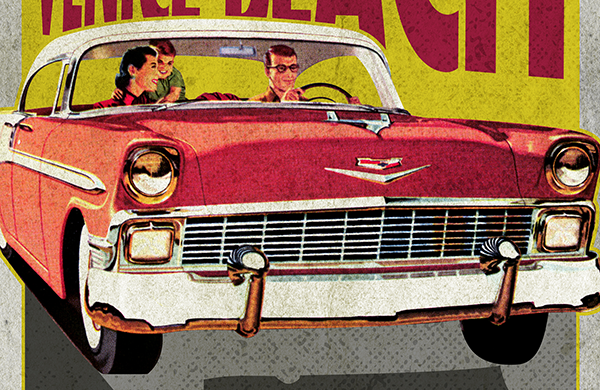 The freebie pack is just a sample of the massive collection you can expect to find in The Eclectic, Vintage Design Library for just $29 (that’s 99% off). This bundle brings you a huge selection of top-of-the-range tools from some of the biggest names in the industry, and not just for the festive season! You will find thousands of high-quality creative resources to help keep your creative juices flowing for all of your projects, all year round! 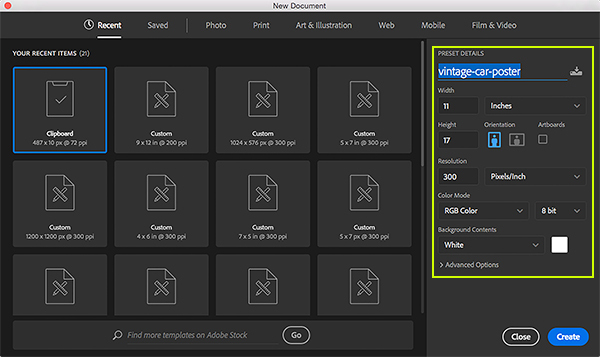 To begin we will open Photoshop and create a New Document that is 11” wide by 17” tall and set to ‘RGB’ Color Mode with the ‘Background Contents’ set to ‘White’. We’ll also want to make sure that we have a ‘Resolution’ of ‘300’ and then we will enter a name for our document. 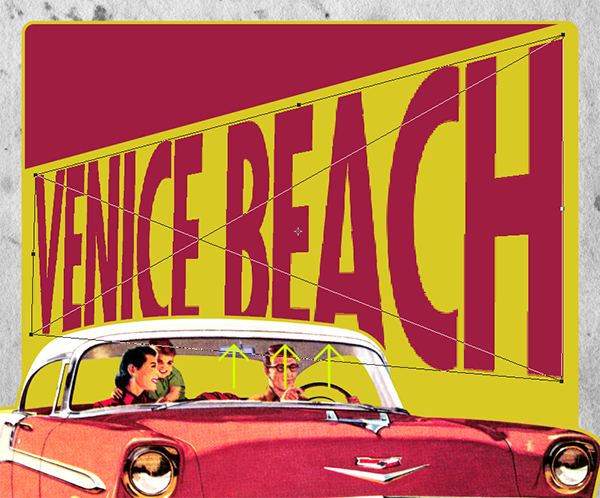 In this case I am using the name ‘vintage-car-poster’ but you can use any name you like. Once you have done that, go ahead and click ‘Create’ from the bottom right corner to make your document. 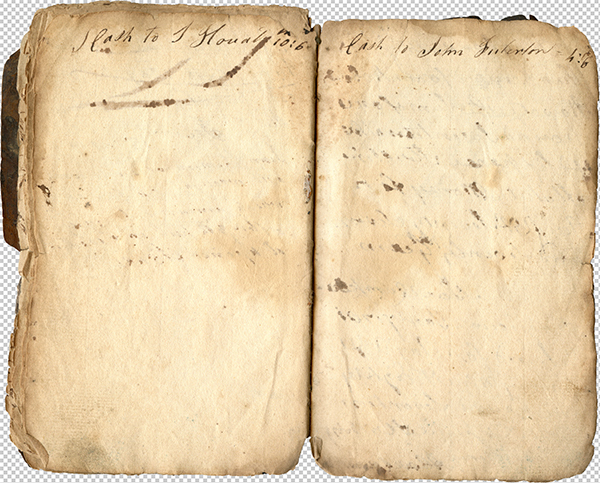 Open the ‘Old Notebooks029.png’ file from the freebies folder in Photoshop. Next, click on the Adjustment Layer icon found at the bottom of the Layers Palette and you will see another dropdown menu. 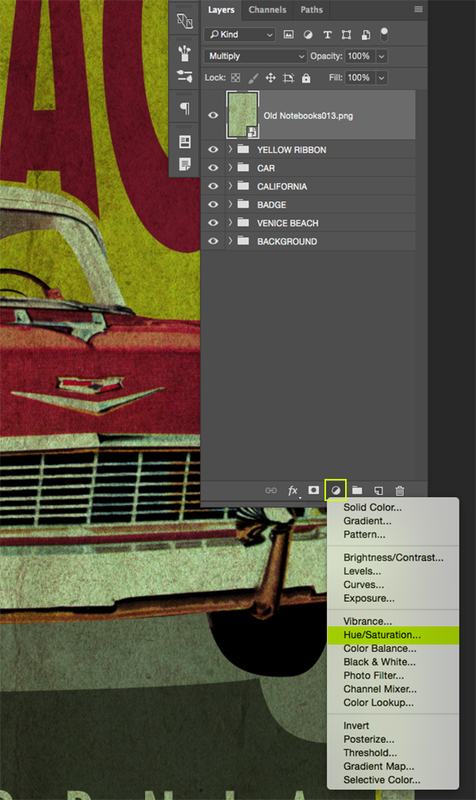 From this menu we want to select the ‘Hue/Saturation…’ option to apply the Adjustment Layer above our texture. 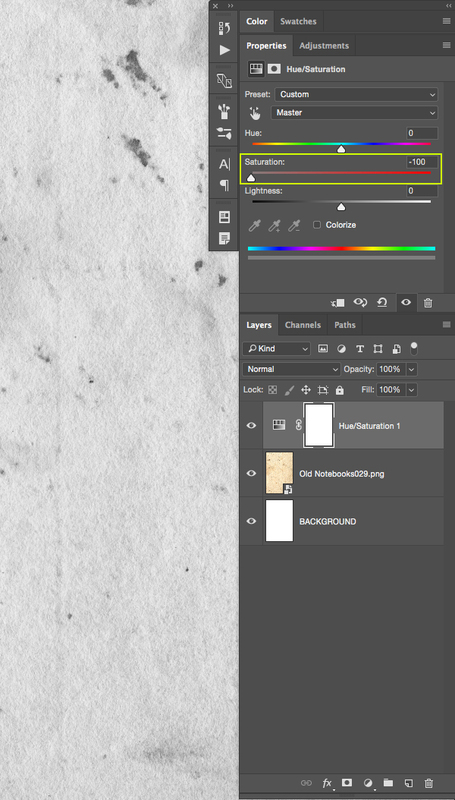 After applying the Hue/Saturation Adjustment Layer you should now see the ‘Properties’ where we are simply going to move the ‘Saturation’ slider all the way to the left to desaturate everything below this layer. Press the letter ‘U’ on the keyboard and you will then have your Shape Tool. 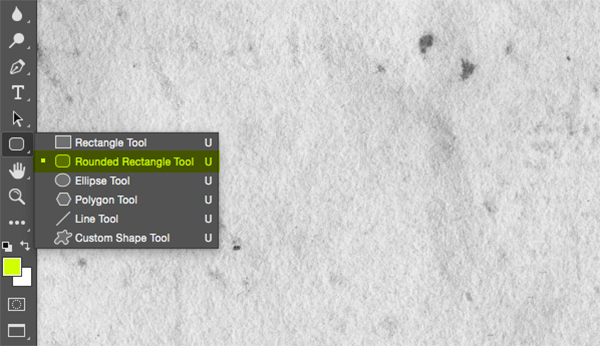 By default you will probably have the ‘Rectangle Tool’ selected, but we’re going to instead be using the ‘Rounded Rectangle Tool’ so what we want to do is click and hold on the tool in the toolbar to reveal a pop-out menu that will enable us to select the other variations of this tool. An alternative way to do this is to press ‘U’ on the keyboard while also holding the Shift Key to scroll through until you come to the ‘Rounded Rectangle Tool’. 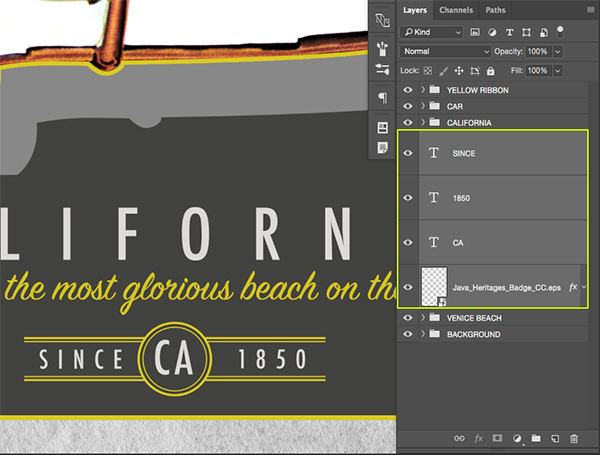 Next, change the fill color to the same color that we used previously when we made our rounded frame – ‘#D9CA23’. 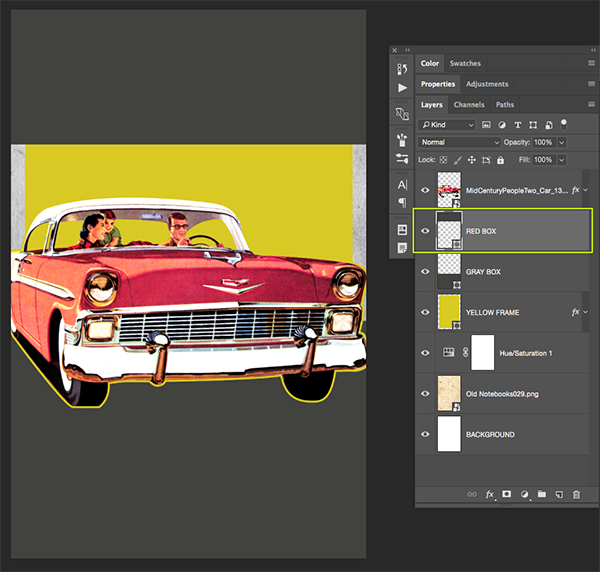 Open the ‘MidCenturyPeopleTwo_Car_13310.png’ file from the freebies folder for this tutorial in Photoshop. I have already taken the liberty of removing the background from this image to save you guys some time! 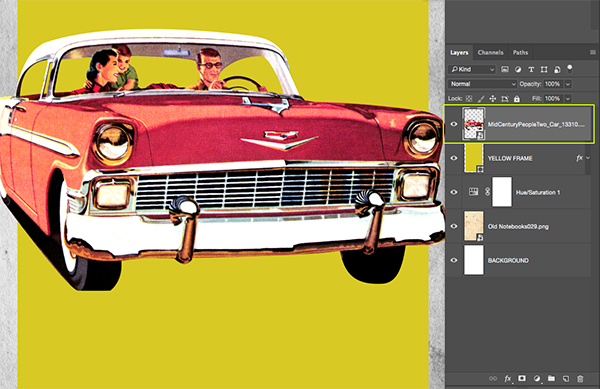 Click and drag the car illustration into your main document and place it at the top of your Layers Palette. 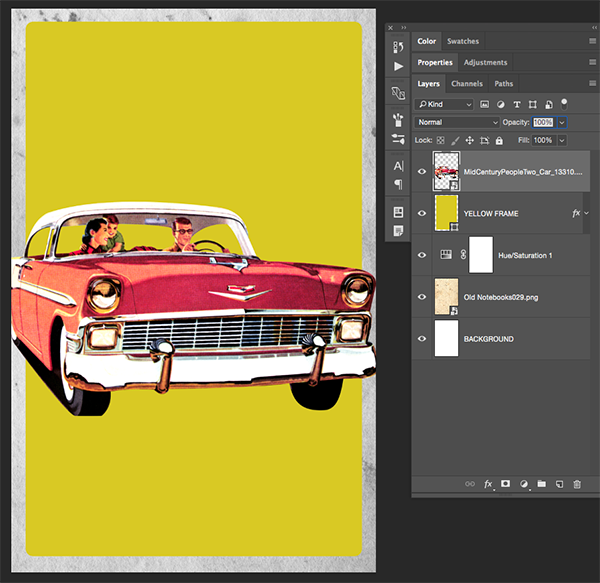 Next, double click the layer name and change it to the name of the file before clicking the layer while holding the Control Key and choosing ‘Convert to Smart Object’ to convert the illustration. 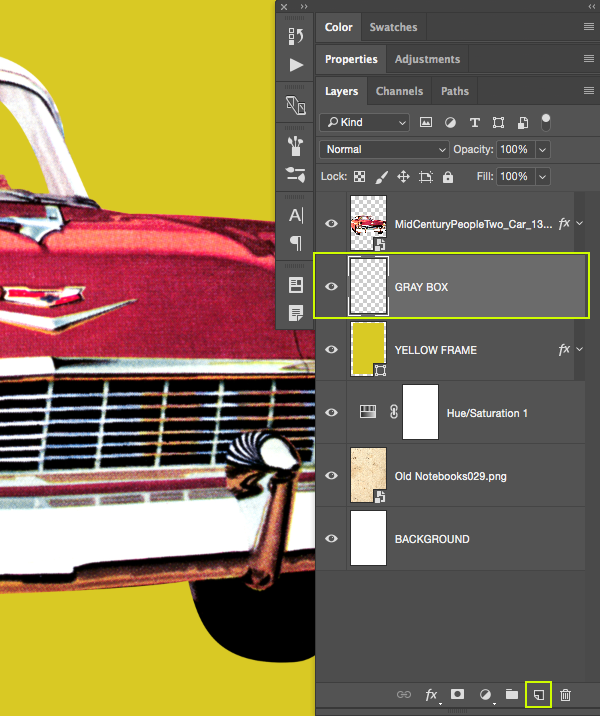 From here, hold the Control Key and click on the small ‘fx’ icon from the ‘YELLOW FRAME’ layer and drag it onto the retro car illustration Smart Object Layer. 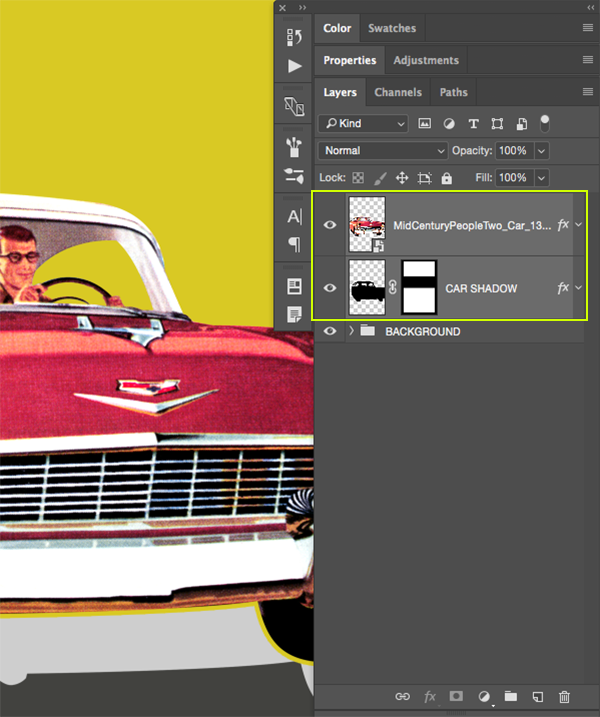 This will copy the same Layer Style effects that we applied previously onto this layer resulting in an 18 pixel yellow stroke around the outline of the car. Hold the Shift Key and press the letter ‘U’ on the keyboard until you have your ‘Rectangle Tool’ selected. You should now see the settings for your tool running across the top of the interface. 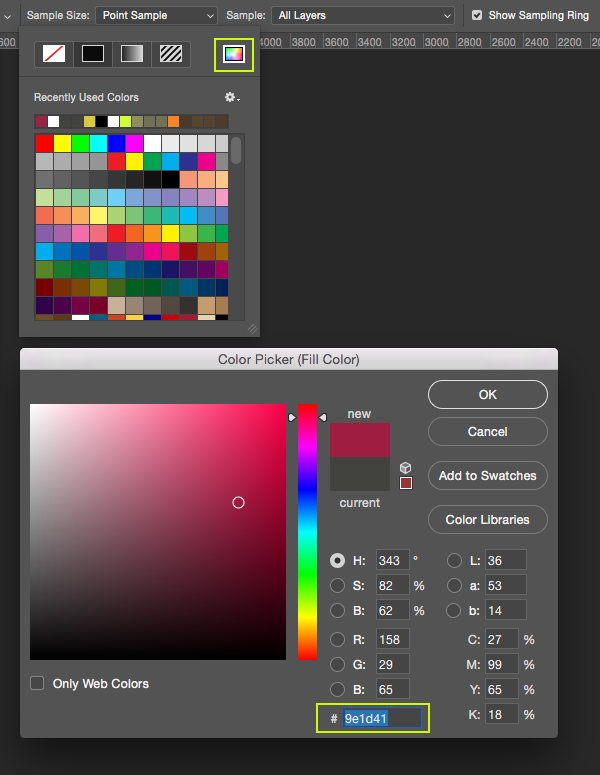 Click on the ‘Fill’ option, and then hold the Command Key and click on the color spectrum icon. From here we will enter the custom hex value ‘#42423F’ which should be a dark gray color. 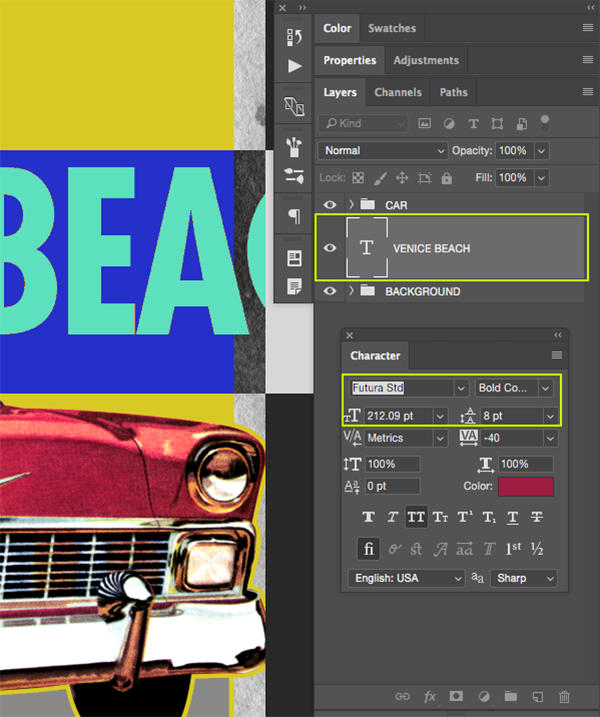 Rename this layer copy ‘RED BOX’ and then press the letter ‘U’ once again to reveal the settings along the top toolbar. From here, open the ‘Fill’ option for the shape before holding the Command Key and clicking on the color spectrum icon. This time let’s enter a hex value of ‘#9E1D41’ before pressing ‘OK’ to apply the change and close out of the dialog box. Press Command/Ctrl+T to initiate a Free Transform and then click on the red box while holding the Control Key to reveal the dropdown menu. From this list we want to choose the ‘Distort’ option. 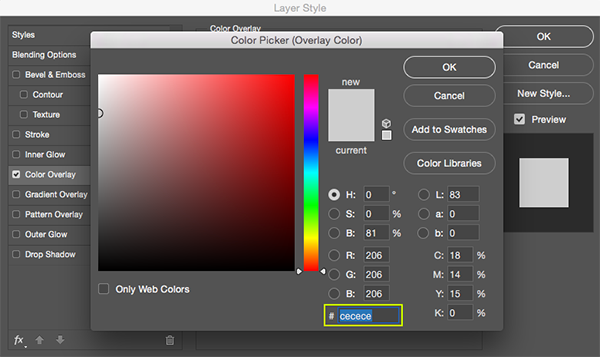 Select the ‘RED BOX’ layer, and then hold the Shift Key and select the ‘GRAY BOX’ layer below it so both layers are selected simultaneously. 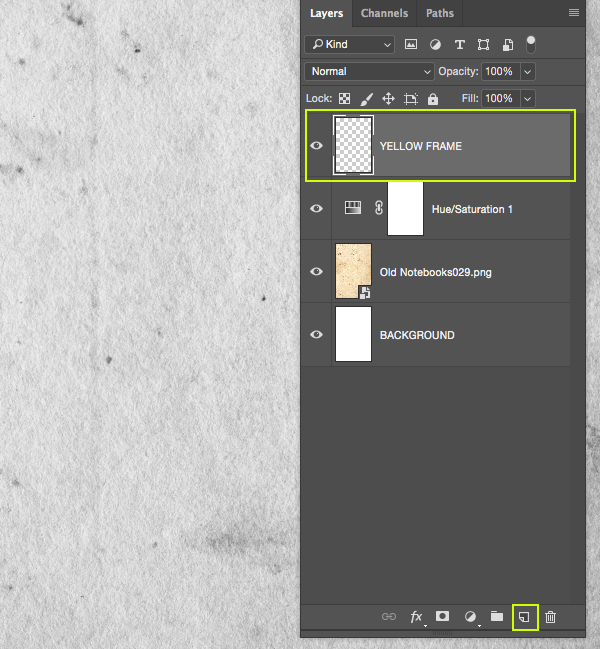 With both layers selected, press Command/Ctrl+G or select the ‘Group Folder’ icon from the bottom of the Layers Palette to place the layers into a new folder. Next, double click on the ‘Group 1’ text to rename this folder ‘COLOR STRIPS’. 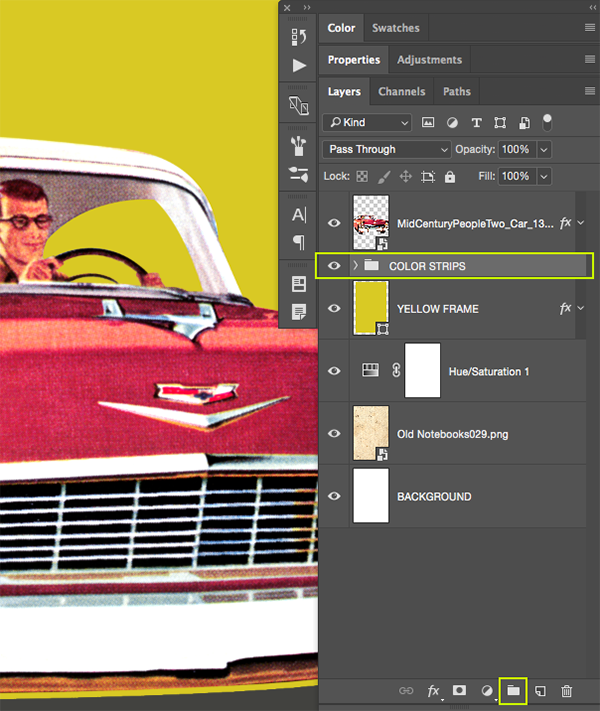 Make sure that you have your newly created ‘COLOR STRIPS’ folder selected in your Layers Palette. 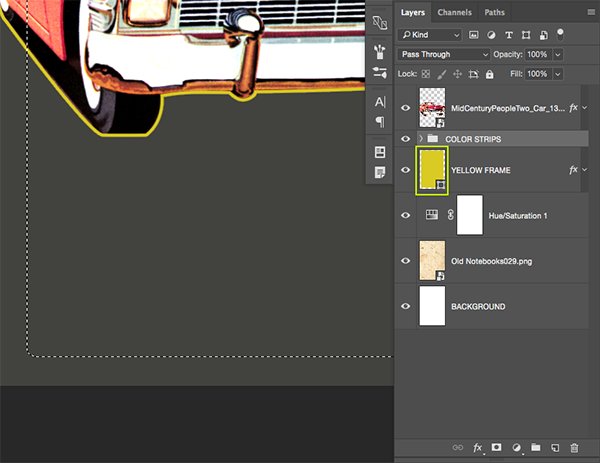 From here, hold the Command Key and click on the layer thumbnail icon of the ‘YELLOW FRAME’ layer directly below. This will activate a selection around the inner part of the yellow frame, not including the yellow stroke around the shape. 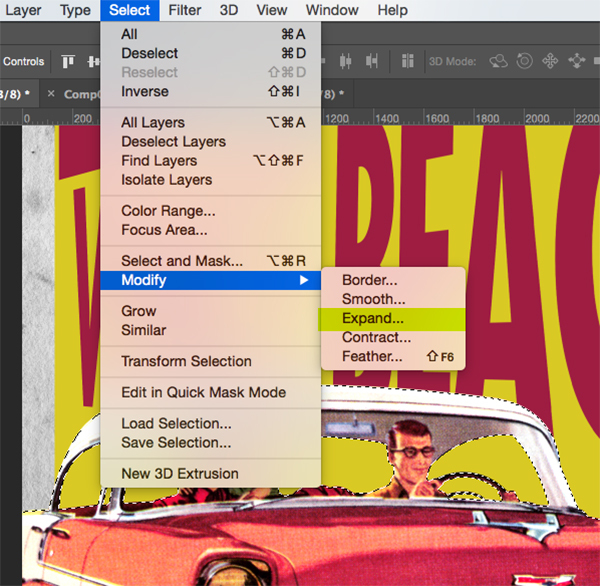 With your selection now active and your folder still selected in the palette, click on the ‘Add Layer Mask’ icon found at the bottom of the Layers Palette to apply a mask. This will ensure that the red and gray color strips are both contained within the inner portion of the yellow box. 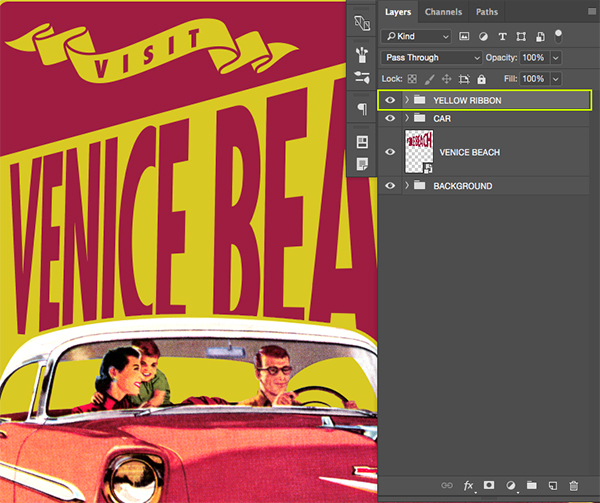 Next, select the ‘COLOR STRIPS’ folder, hold the Shift Key, and select the ‘BACKGROUND’ folder all the way at the bottom of your Layers Palette so all of the layers in between are selected. 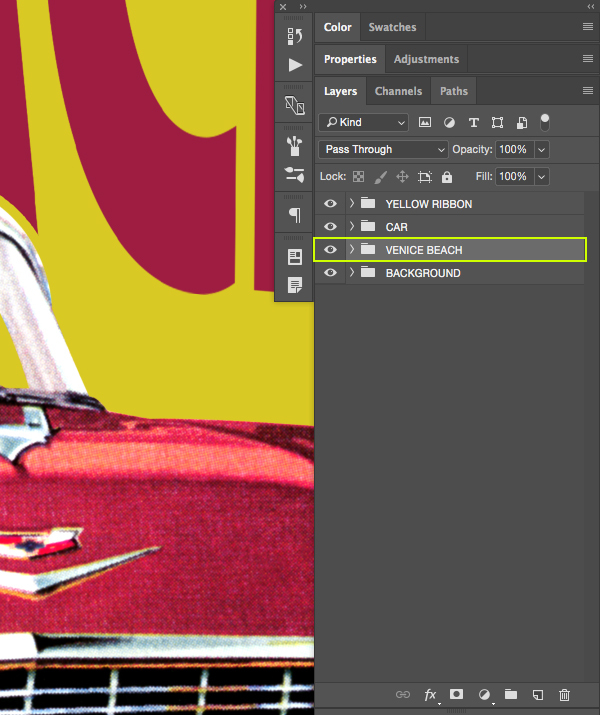 Hold the Command Key and click on the layer thumbnail icon of the retro car Smart Object layer to activate a selection around it. 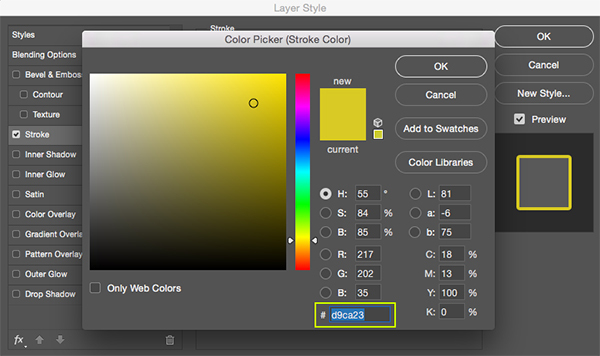 With your selection still active, click on the ‘Create a new layer’ icon from the bottom of the Layers Palette, or use the keyboard shortcut Command/Ctrl+Alt/Option+Shift+N. 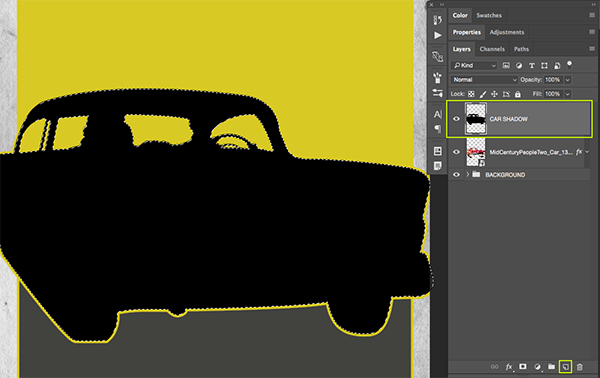 After creating your new layer, double click the ‘Layer 1’ text and rename this layer ‘CAR SHADOW’. 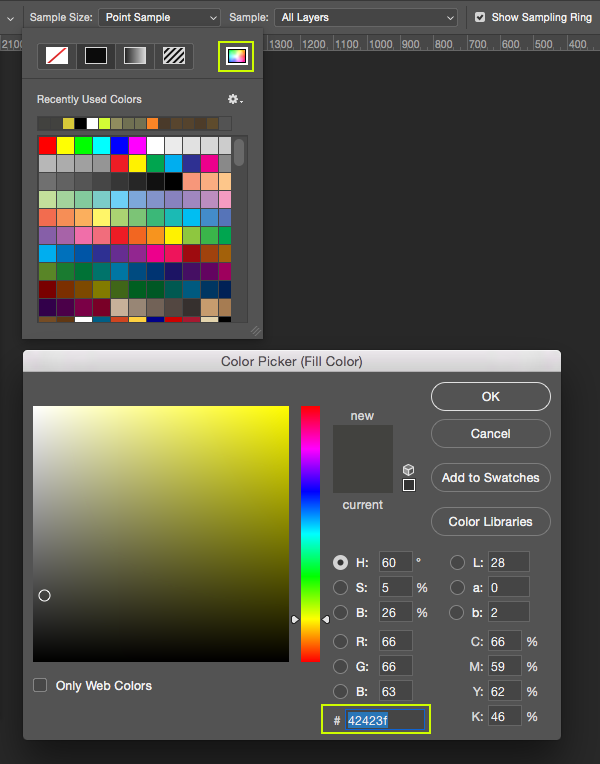 Press the letter ‘D’ on the keyboard to get your default colors and black should now be your foreground color. 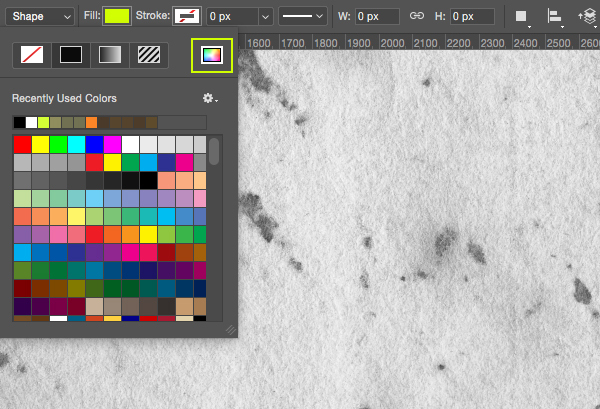 If instead you are seeing white as the foreground color, simply press the letter ‘X’ to toggle them. From here, simply press Alt/Option+Delete on the keyboard and it should fill the active selection on your new layer with solid black. Once you’ve done that, press Command/Ctrl+D to deactivate the selection. 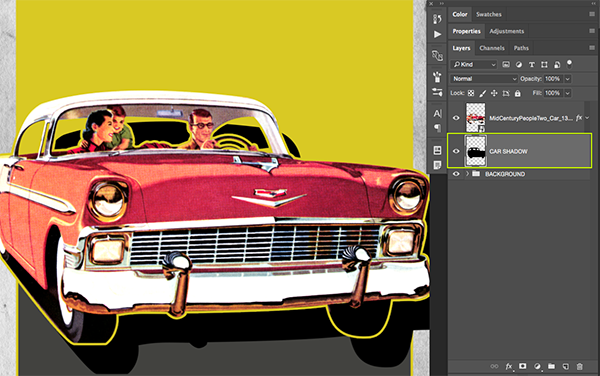 Double click on the ‘CAR SHADOW’ layer to open the Layer Style panel and check off the ‘Color Overlay’ option. 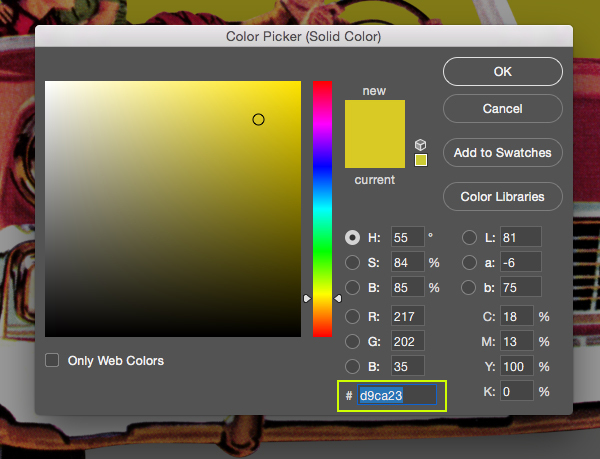 For the fill color enter the hex value ‘#CECECE’ and then press ‘OK’ to apply the changes and close out of both dialog boxes. 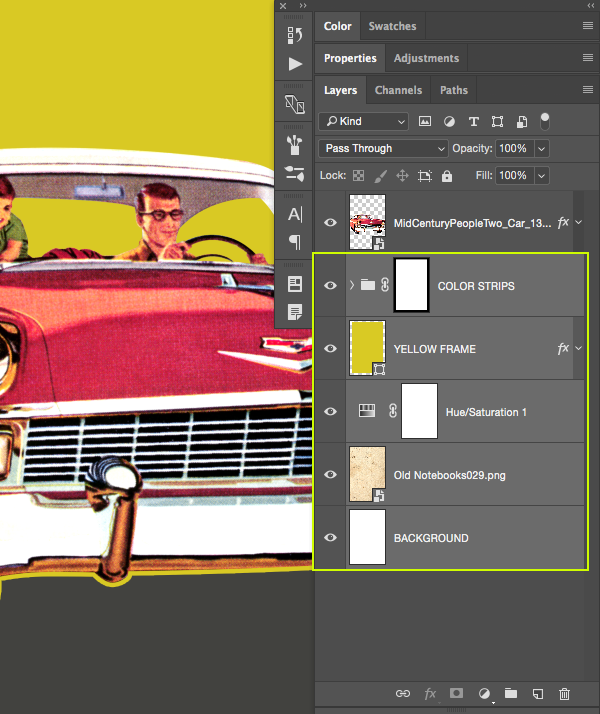 Now that we’ve lightened up our shadows we will need to mask them so they don’t spill outside of the yellow frame. 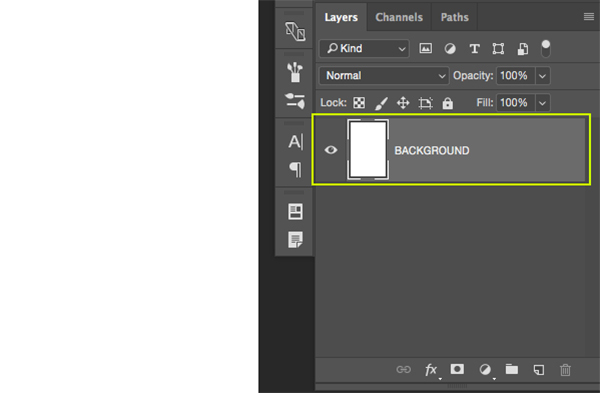 To do this we will first need to click the small arrow next to our ‘BACKGROUND’ folder to reveal the contents of the layers inside. 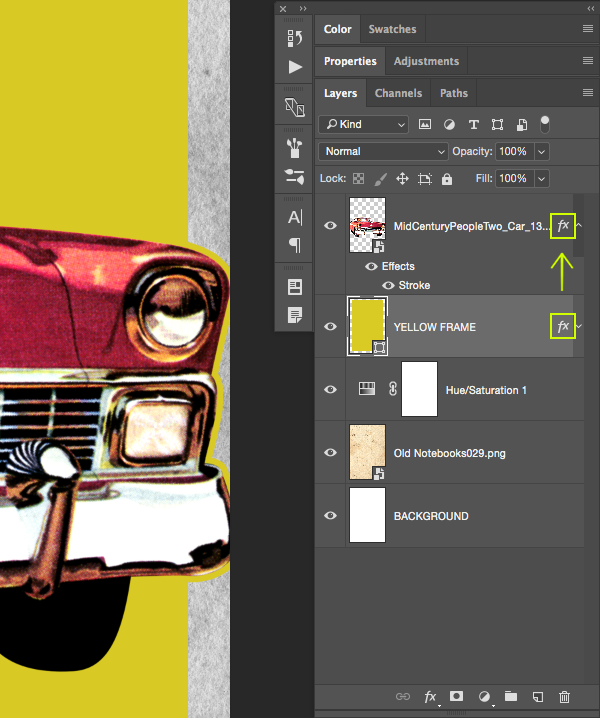 From here, hold the Command Key and click on the layer thumbnail icon for the ‘YELLOW FRAME’ layer in order to activate a selection around it. 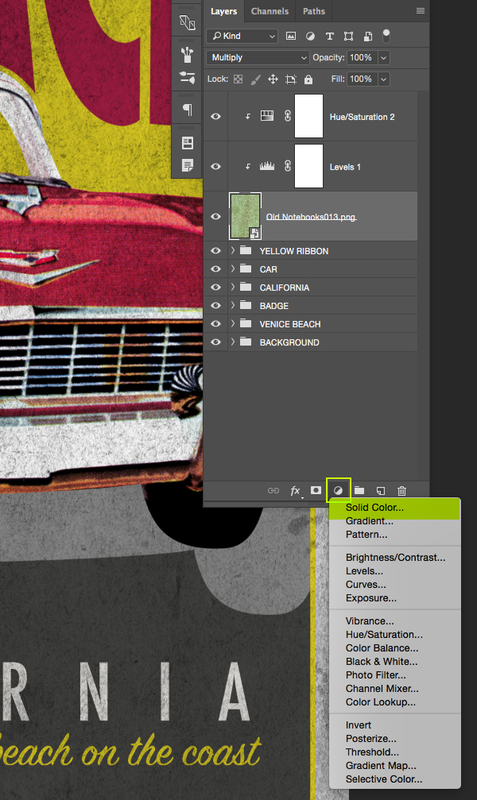 Notice that in the image below I still have my ‘CAR SHADOW’ layer selected even though I’ve clicked the layer thumbnail icon of a different layer to use it to make a selection. 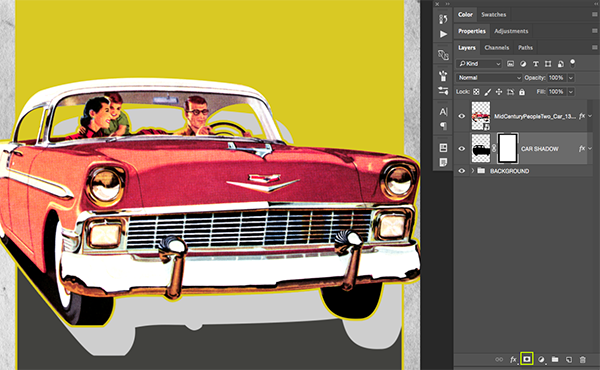 With your selection still active, and your ‘CAR SHADOW’ layer selected in your Layers Palette, click on the ‘Add Layer Mask’ icon to apply a mask to the shadow layer. Doing this will ensure that it stays contained within our frame. 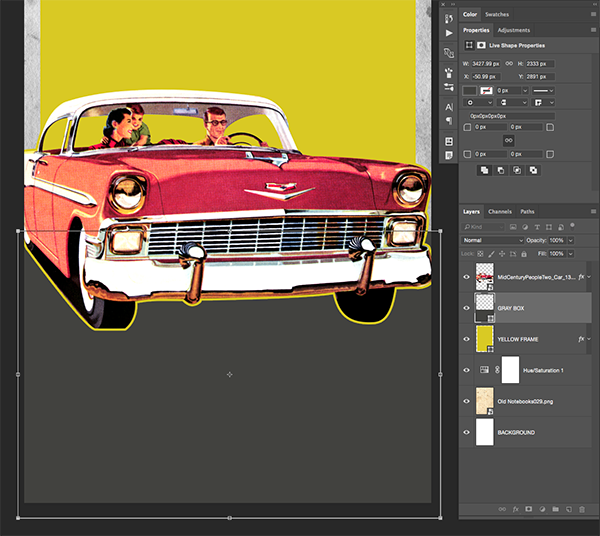 Select the car Smart Object layer in the Layers Palette, and then hold the Shift Key and select the ‘CAR SHADOW’ layer just below. 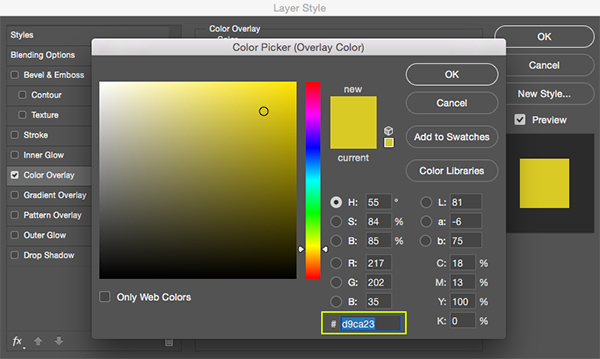 While both of your layers are highlighted in the Layers Palette, press Command/Ctrl+G to place both of these layers into a new folder. 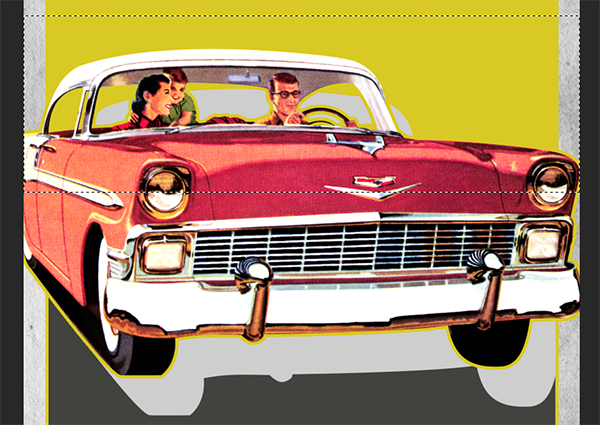 Double click the name of the folder and change it to ‘CAR’ or give it a similar name of your choice. 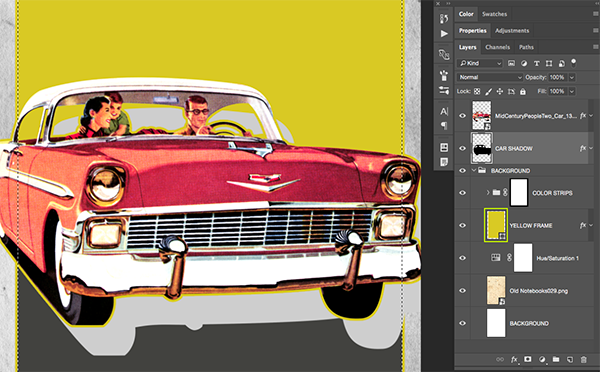 Before moving one we just need to make one more adjustment to the ‘CAR SHADOW’ layer so expand the ‘CAR’ folder and select the shadow layer, and then press the number ‘5’ on your keyboard or you can manually move the ‘Opacity’ slider to the left until the shadow is set to ‘50%’ resulting in a slightly less distracting shadow. After that you can collapse the ‘CAR’ folder by once again clicking the arrow to the left of the folder name. 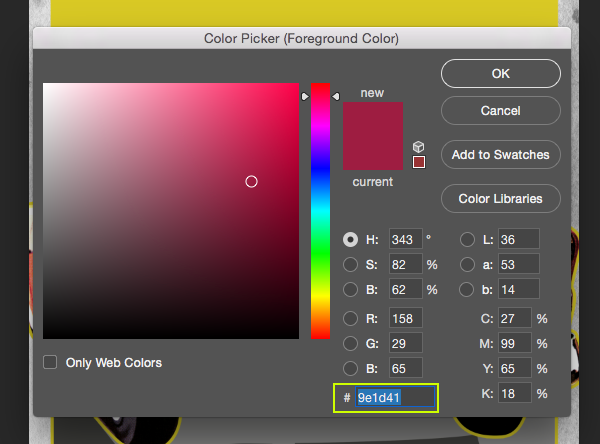 Click on the foreground color at the bottom of your toolbar and enter the hex value ‘#9E1D41’ that we used for the ‘RED BOX’ layer earlier on. After placing your text, hold the Control Key and click on the text layer before choosing ‘Convert to Smart Object’ from the dropdown menu. Open the ‘Java_Heritages_Ribbon_CC.eps’ file from the freebies folder for this tutorial. There are several versions of this file saved so be sure to use which ever version is compatible with your version of Illustrator. Once the file is open, press Command/Ctrl+A to ‘Select All’ and then Command/Ctrl+C to copy the ribbon. 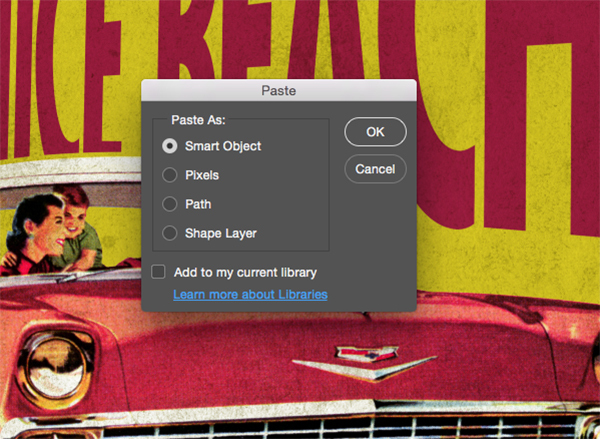 Then, return to Photoshop and paste the layer as a Smart Object into your file. Here I have placed the ribbon in the upper left corner while also scaling it up a bit by dragging outwards from the corner of the bounding box while holding the Shift Key. 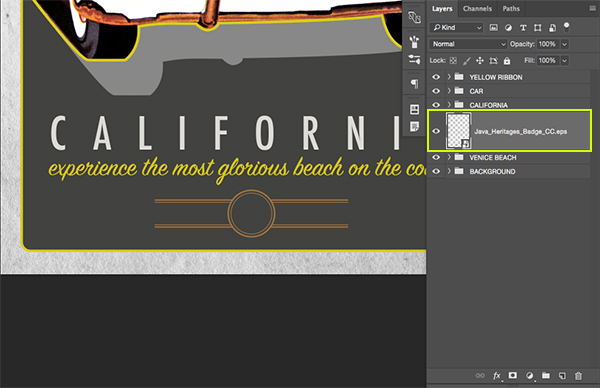 Also, let’s change the name of the layer to match with the file name so we can identify it quickly and easily. 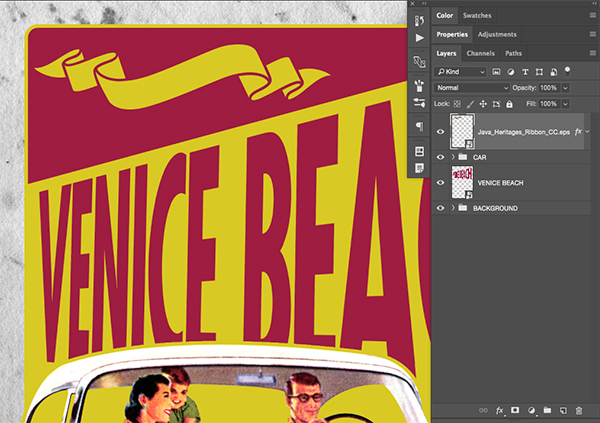 Double click the vector ribbon layer to bring up the Layer Style panel, and then check off the ‘Color Overlay’ option. 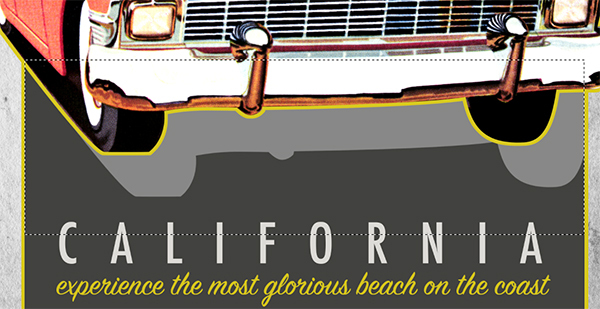 Step 19: Come and Visit! 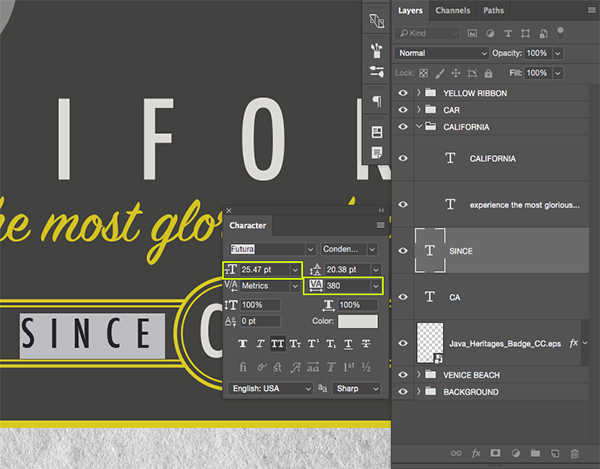 With your Type Tool (T) still active, click two or three times inside of your text box to highlight the type. 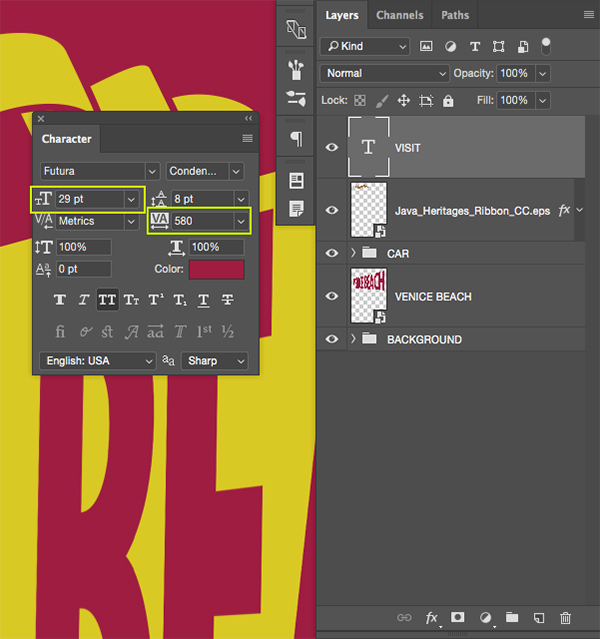 Once the type is highlighted we will then go towards the top toolbar across the interface to choose the small ‘T’ icon with a curved line underneath it. 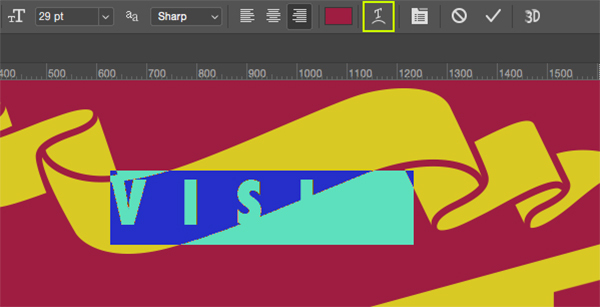 This is the tool we will be using to warp our text and make it fit nicely inside of the banner. 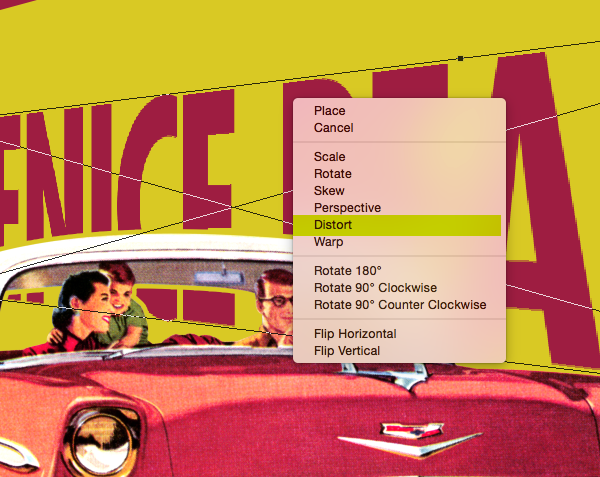 Once the ‘Warp Text’ panel opens you will see a menu next to the word ‘Style’ that we can click on. 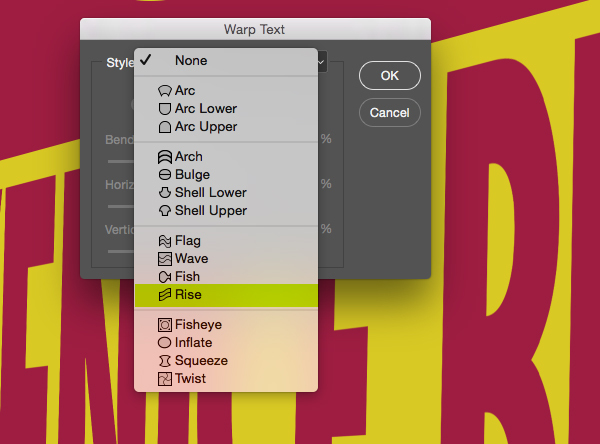 Click on the menu to reveal the warp options and then choose ‘Rise’ from the list. 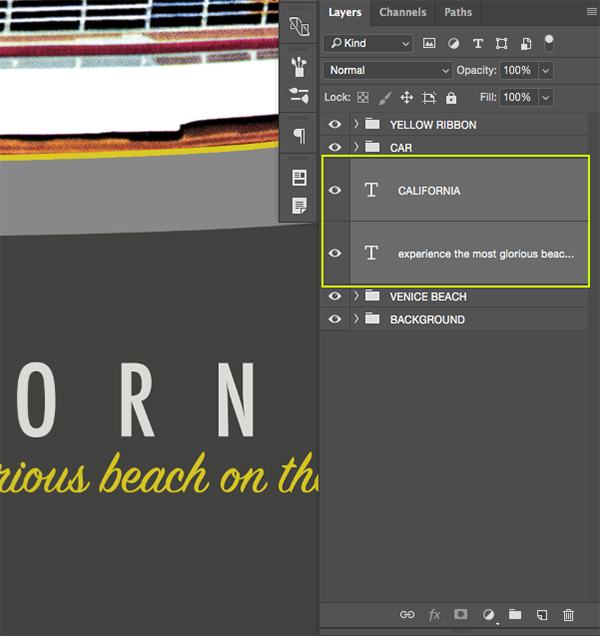 Create a new layer just above the ‘VENICE BEACH’ folder and grab your Type Tool (T) before typing out the word ‘CALIFORNIA’ in all caps on your canvas. 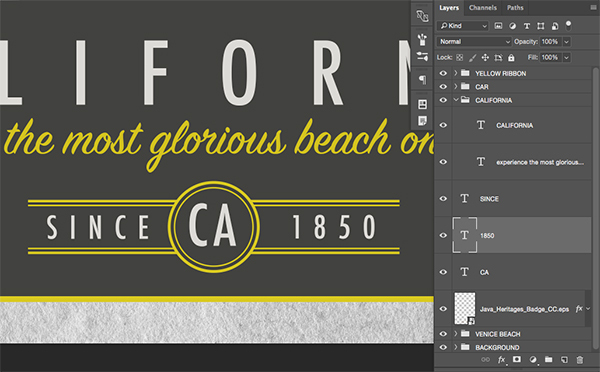 Bring up the Character Panel and use a regular or medium condensed style of ‘Futura’ that we used earlier. 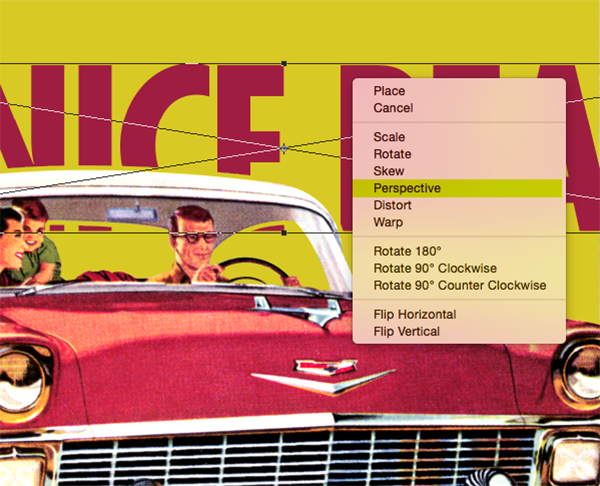 For the settings let’s make the size about ’70 pt’ and keep the tracking at around ‘580’. We also want to make sure that our text is a light gray color so all we need to do to change the color is click inside of our text box to highlight the type and then click on the ‘Color’ option inside of our Character Panel and changing it to ‘#DCDAD6’. 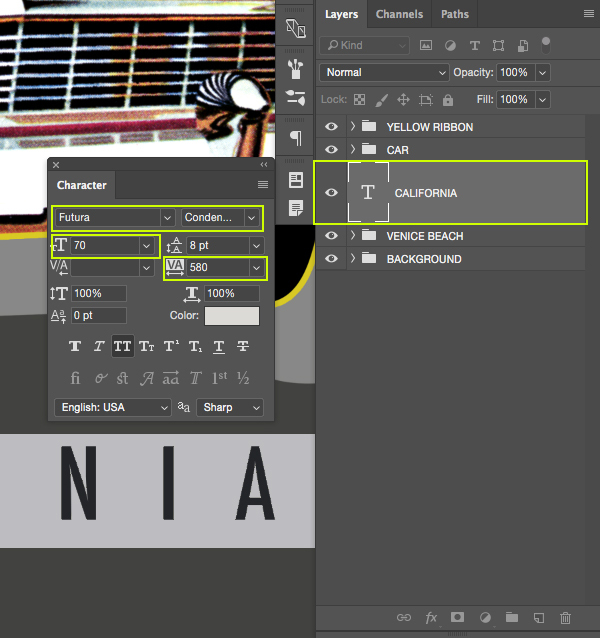 Select the ‘CALIFORNIA’ text layer, then hold the Shift Key and select our script layer below so they are both selected at the same time. 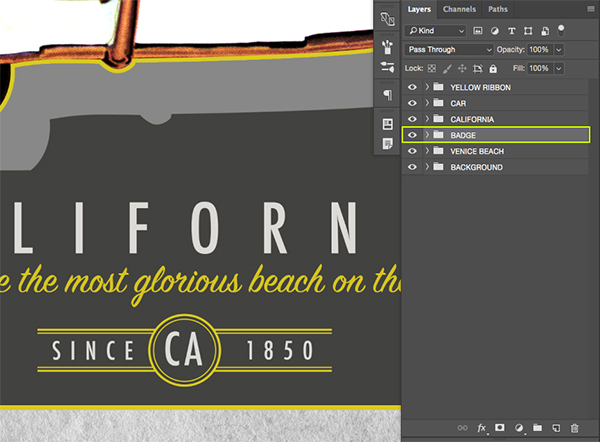 Next, open the ‘Java_Heritages_Badge_CC.eps’ file from the freebies folder in Illustrator. Press Command/Ctrl+A to ‘Select All’ and then copy it by pressing Command/Ctrl+C. From here, you can close the file and return to Photoshop. Paste the badge as a Smart Object into your document and change the layer name to the name of the file or use something that will make it easy for you to identify. Use the image below as a guide for the size and placement of the badge. 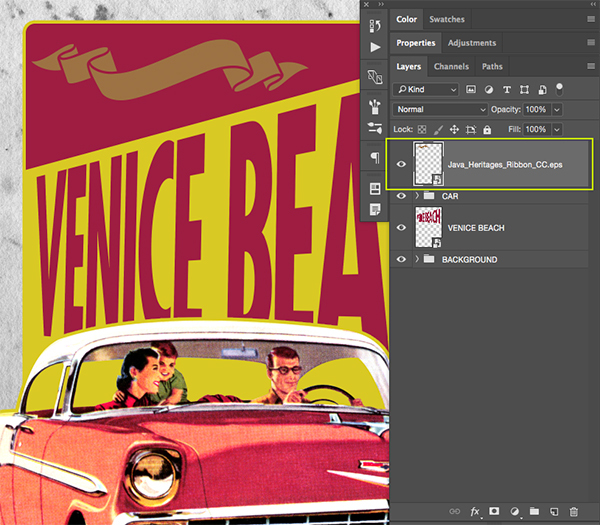 Double click on the badge layer to bring up the Layer Style panel and check off the ‘Color Overlay’ option. 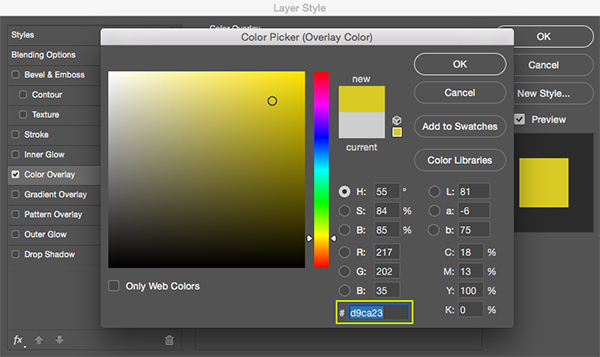 For the fill color use the hex value ‘#D9CA23’ and then click ‘OK’ to apply the changes and close out of both dialog boxes. 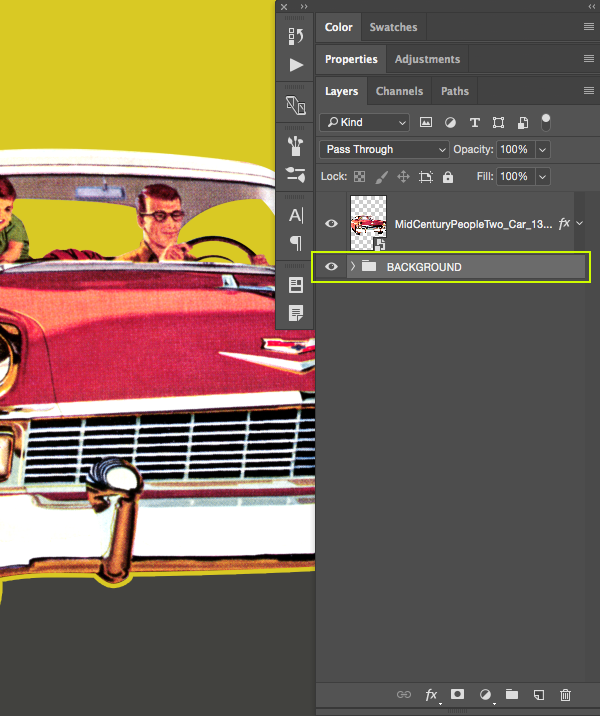 Hold the Command Key and click on the layer thumbnail icon of the retro car illustration to activate a selection around it, and then add a new layer just above the car. When prompted with the ‘Expand Selection’ dialog box, enter a value of ’18 pixels’ and then press ‘OK’ to expand the selection. 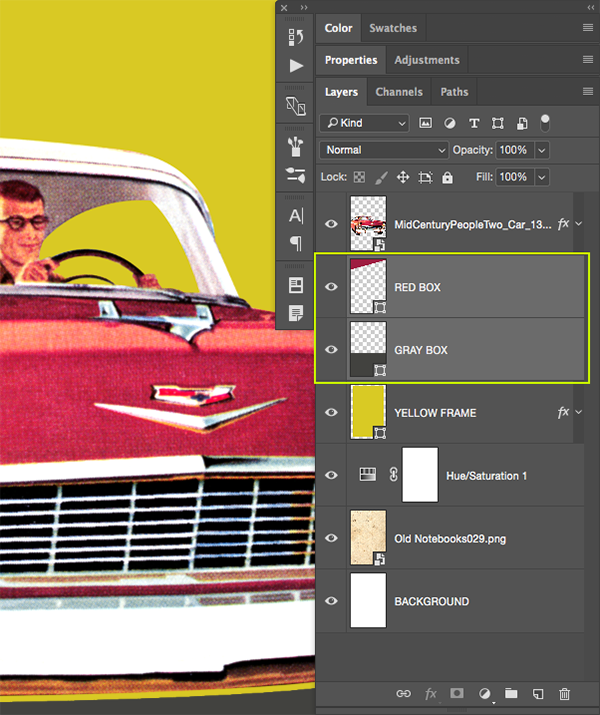 Set your foreground color to the same yellow color we have been using – ‘#D9CA23’ and then press Alt/Option+Delete on the keyboard to fill the selection on your new layer with yellow. 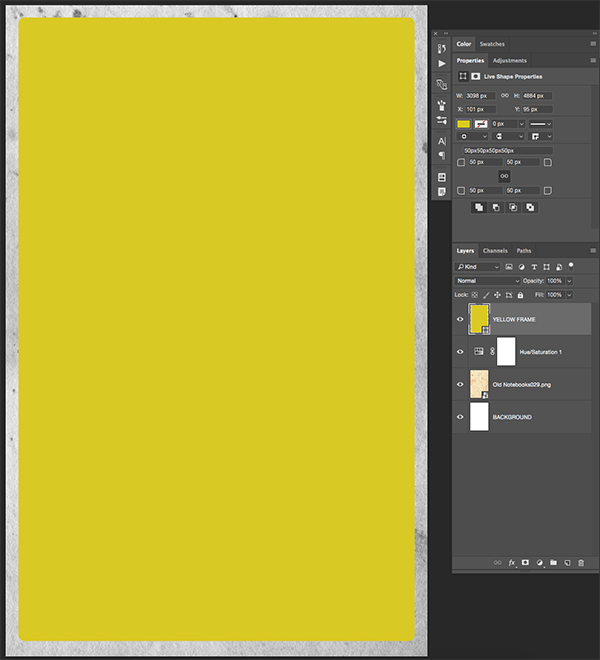 Rename this layer ‘YELLOW STROKE’ and then press Command/Ctrl+D to deselect everything. 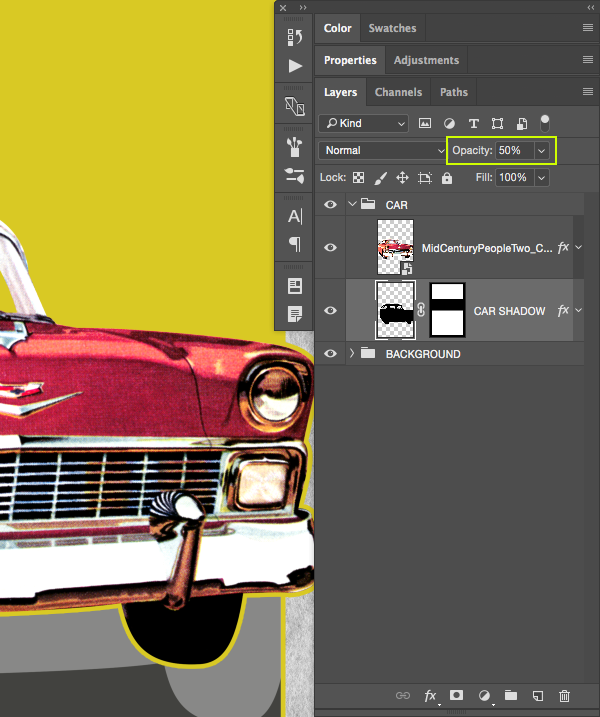 From here, press the Command Key along with the left bracket key on your keyboard to move this layer down one place so that it is now beneath the car illustration. 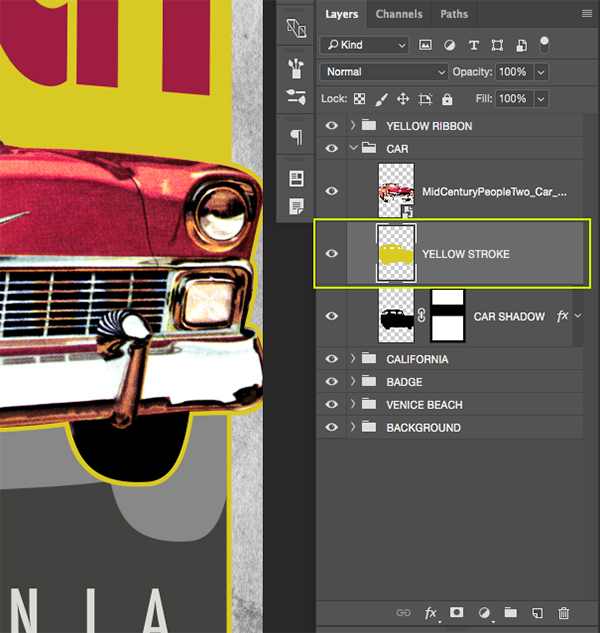 Conversely, you could also just manually drag the ‘YELLOW STROKE’ layer below the car. From here we can simply press ‘Delete’ to remove the yellow stroke from the bottom of the car. At this point you should only see the yellow stroke on the top and the sides of the car which is exactly what we want. 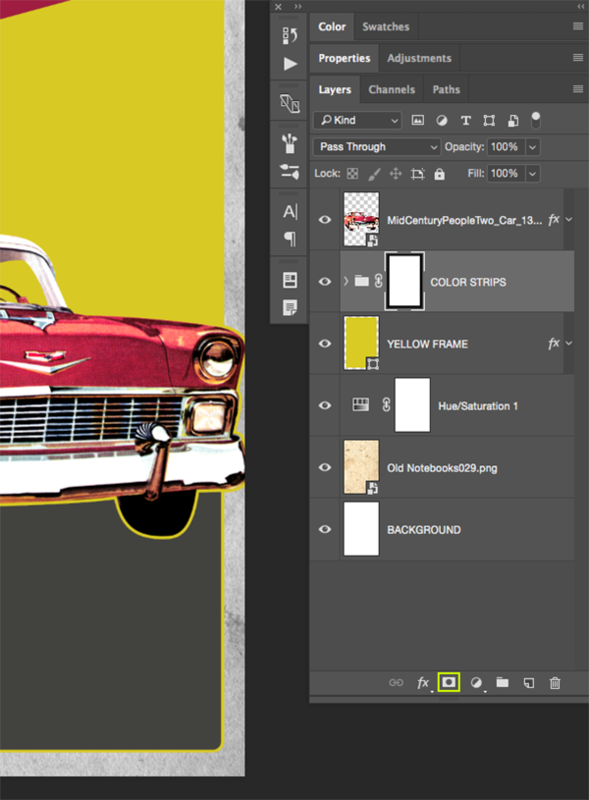 The yellow line on the top of the car helps to break up the car from the type, and the stroke on the sides tie it together with the outline around our frame. 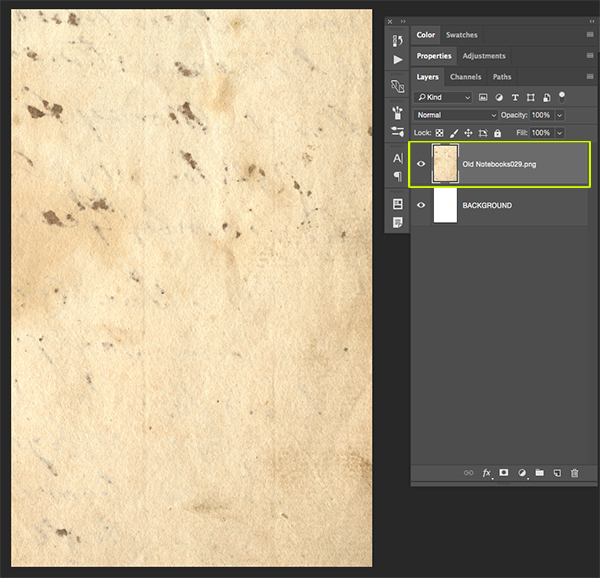 Open the ‘Old Notebooks013.png’ file from the freebies folder in Photoshop. 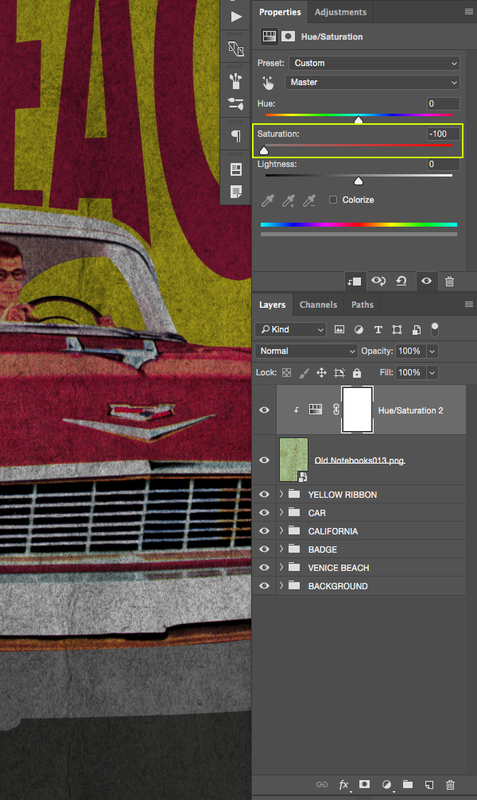 Next, select your texture Smart Object and then hold the Alt/Option Key and click the Adjustment Layer icon from the bottom of the Layers Palette. 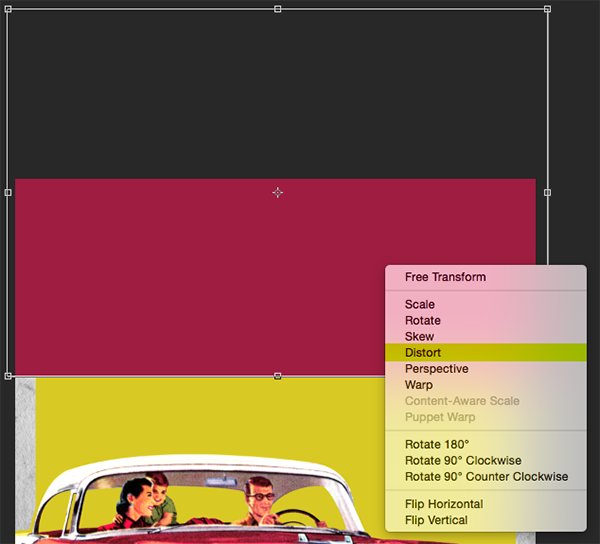 When the menu appears we want to choose ‘Hue/Saturation…’ from the list. 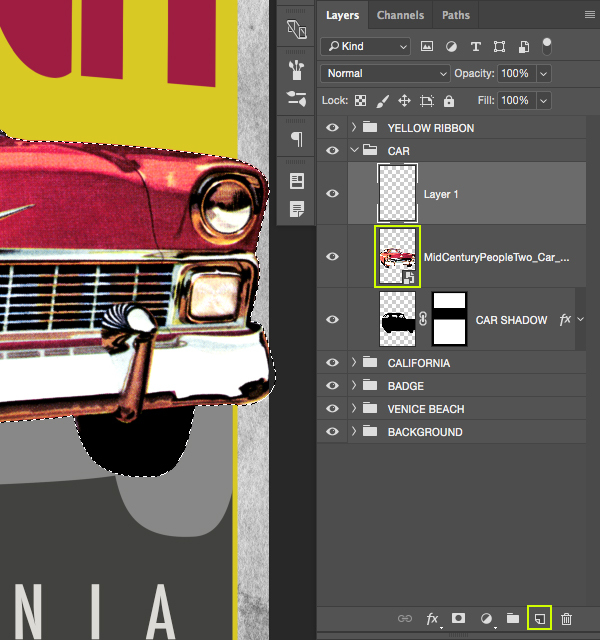 When the ‘New Layer’ dialog box appears make sure to check off the box that says ‘Use Previous Layer to Create Clipping Mask’ and then click ‘OK’. 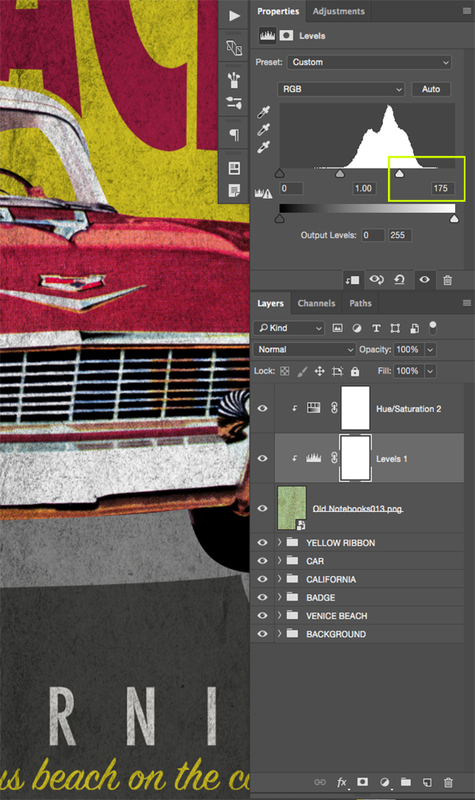 Once again select your Smart Object texture at the top of the layer stack and then click the Adjustment Layer icon at the bottom of the Layers Palette. This time we want to choose ‘Levels…’ from the list that pops up. Let’s go ahead and add one more Adjustment Layer by first selecting our Smart Object texture, then clicking the Adjustment Layer icon and choosing ‘Solid Color…’ from the top of the list. 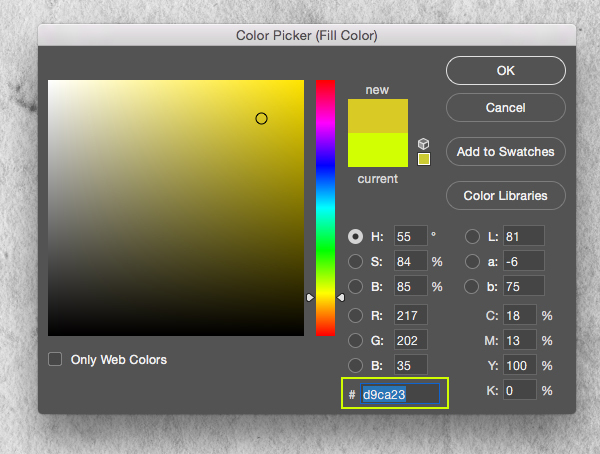 For the color, we are going to once again use our yellow – ‘#D9CA23’ and then click ‘OK’ to apply the changes. 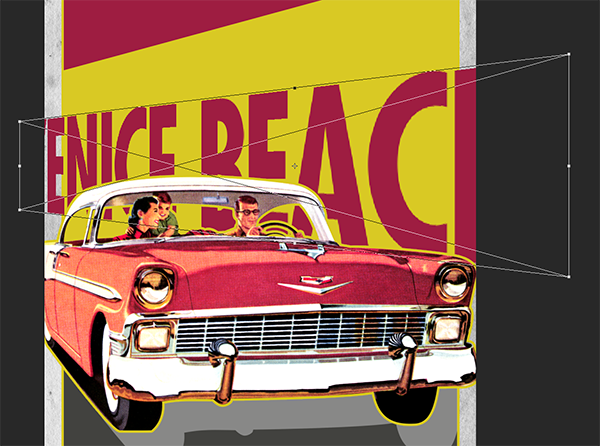 Next, open the ‘The_Beacon_Collection_Texture_CC.eps’ file from the freebies folder for this tutorial in Illustrator. Press Command/Ctrl+A to select everything and then Command/Ctrl+C to copy it before closing the window and returning to Photoshop. Once you are back in Photoshop, press Command/Ctrl+V and paste this as a Smart Object before pressing ‘OK’ to bring in the vector texture. 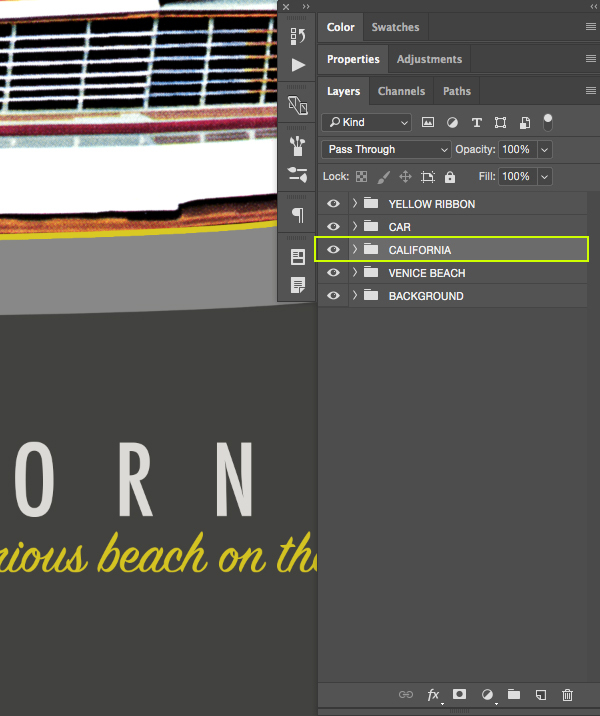 After that, rename the layer with the name of the file. 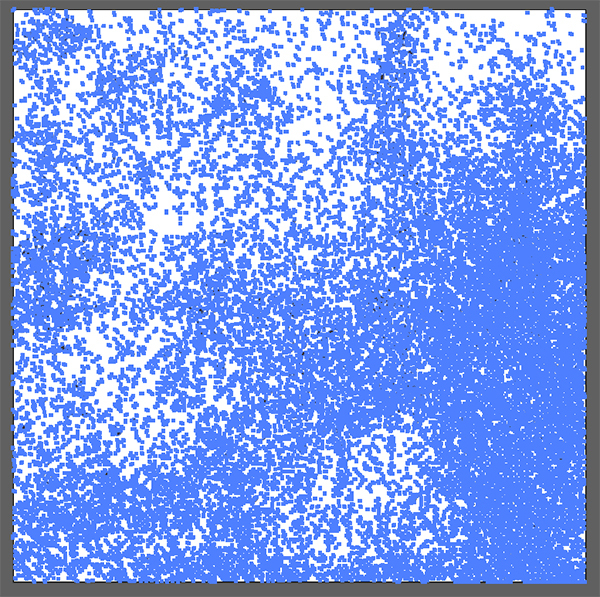 By default, the texture will appear pretty small, so we want to scale this up by dragging any of the four corners of the bounding box outwards while holding the Alt/Option+Shift keys and make sure the texture covers the whole canvas before pressing ‘Return’ to apply the changes. 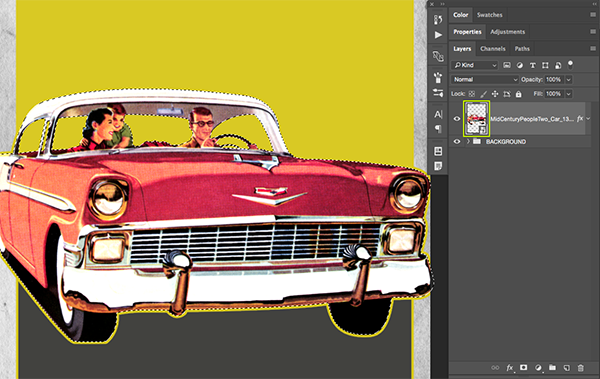 Double click on the vector texture layer to bring up the Layer Style panel and check off the ‘Color Overlay’ option. For this we will use a solid black color and change the Blend Mode to ‘Overlay’ before reducing the opacity to about ‘22%’. 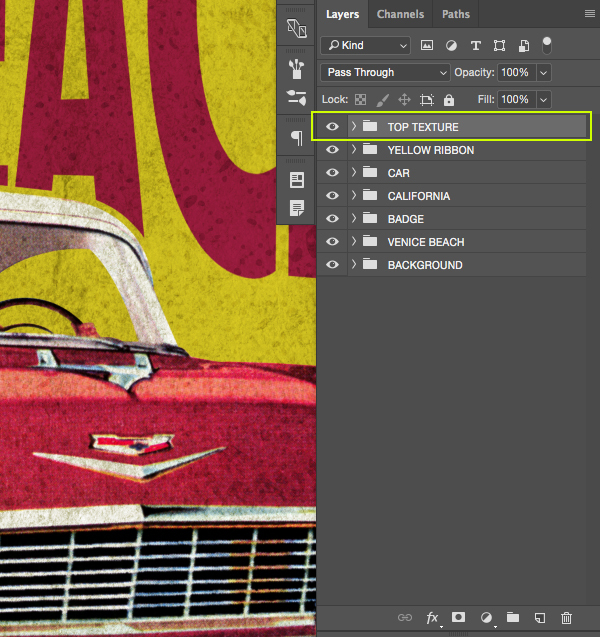 Once you have done that, go ahead and press ‘OK’ to apply the changes and bring back the texture. 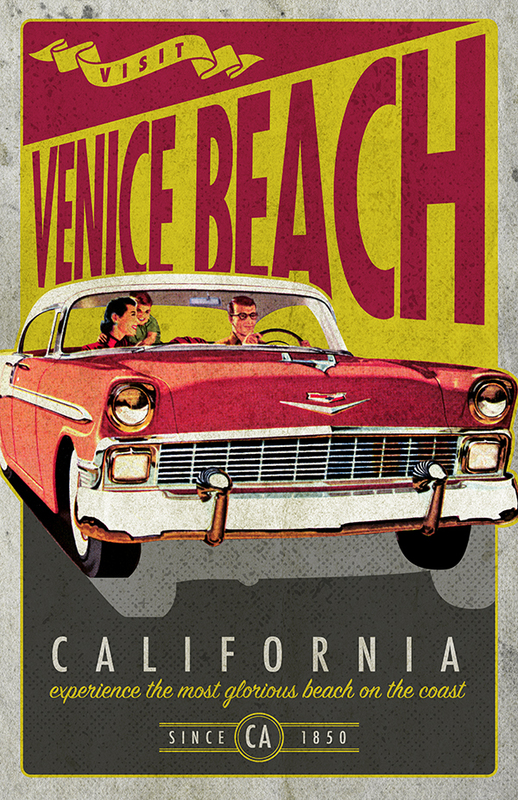 We have now completed our Vintage Car Poster! 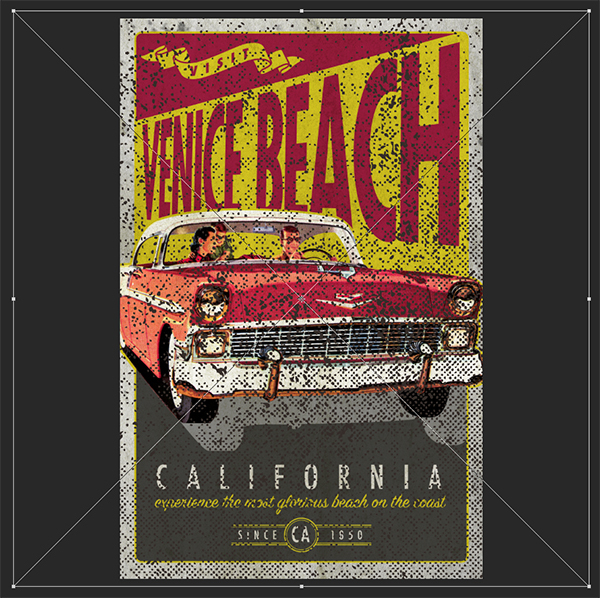 We designed this image with a small handful of elements from this completely packed design bundle. 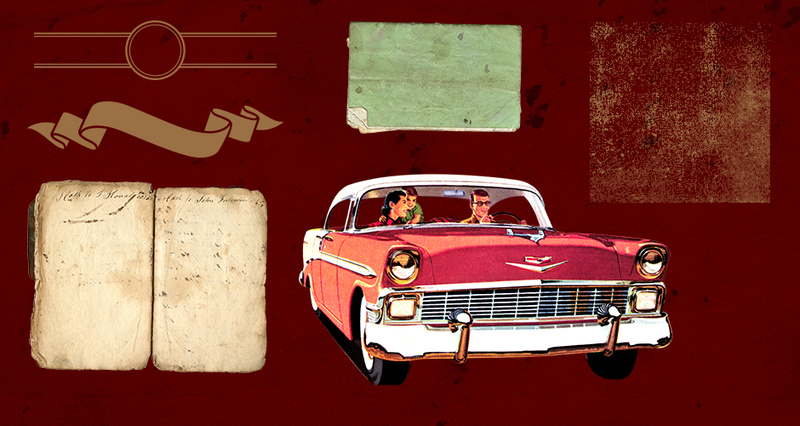 The full bundle has hundreds of vintage photos, textures, and fonts for your next project. This eclectic library of beautiful work will surely help you step up your design game and we can’t wait to see what you create with these amazing resources! There’s still time to check out The Eclectic, Vintage Design Library featuring thousands of high-quality creative resources ranging from ready to use elements to professional-grade effects packs. This bundle will be your new best friend making sure you are never stuck for that perfect brush or texture all for an unbeatable price of $29! This is great news! We’d love to see anything you create over on our Facebook Community Group! I am happy every week. Actually always interesting and fun. Hey thanks for the first tutorial of the year. 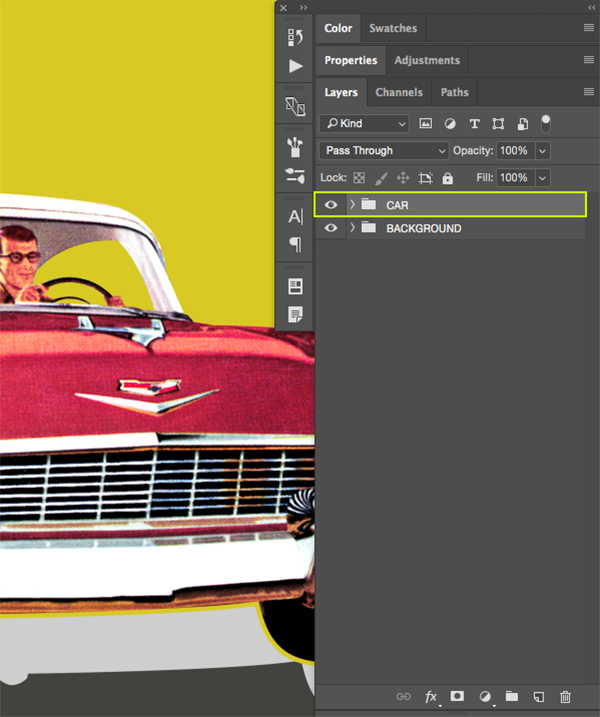 I’m having an issue though, the car file downloaded in the piddix folder here still has the background. Could you check and maybe reupload with the transparent version? Thanks! Thanks so much for your comment and we are so sorry about this! Hey Sarah, well done thnx! You’re so welcome and i’m sorry to hear that you are having trouble! 1. Open the desired element image file from the freebie folder. 2. 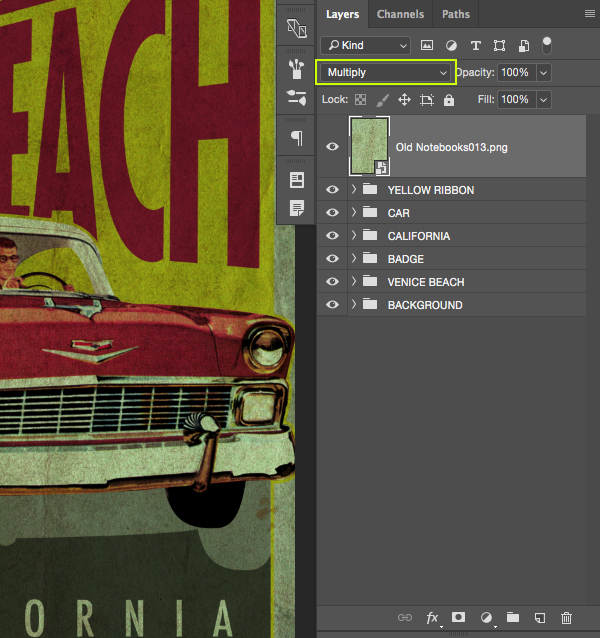 Drag the file image layer into the main document window. 3. 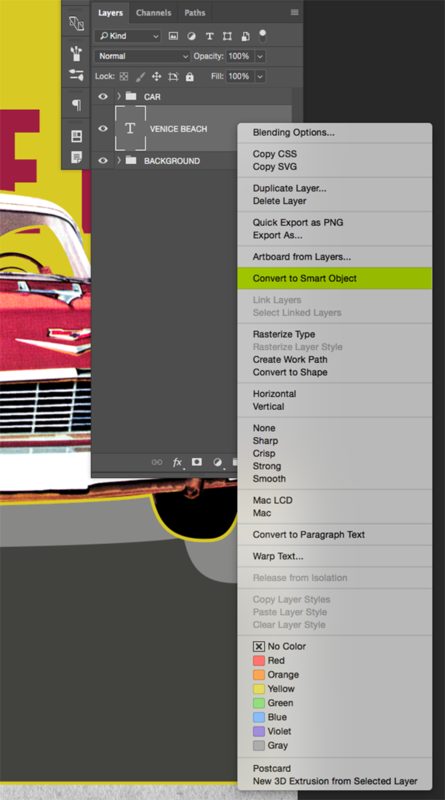 Right-click (or Control-click on the Mac) on the layer and choose the Convert to Smart Object option from the menu. 4. 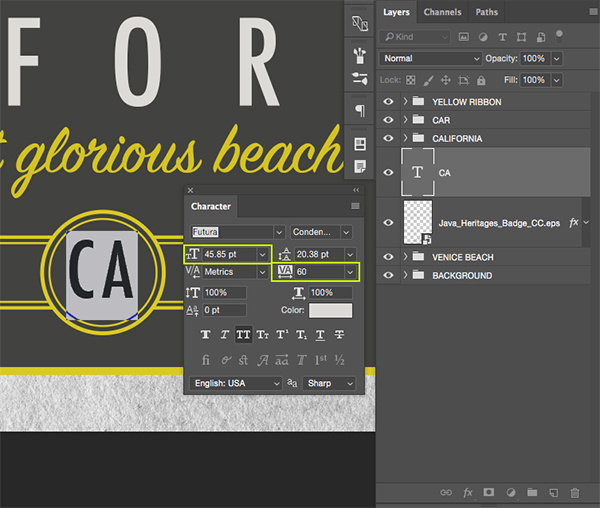 Double-click the layer name to rename the layer to the same name as the source filename. 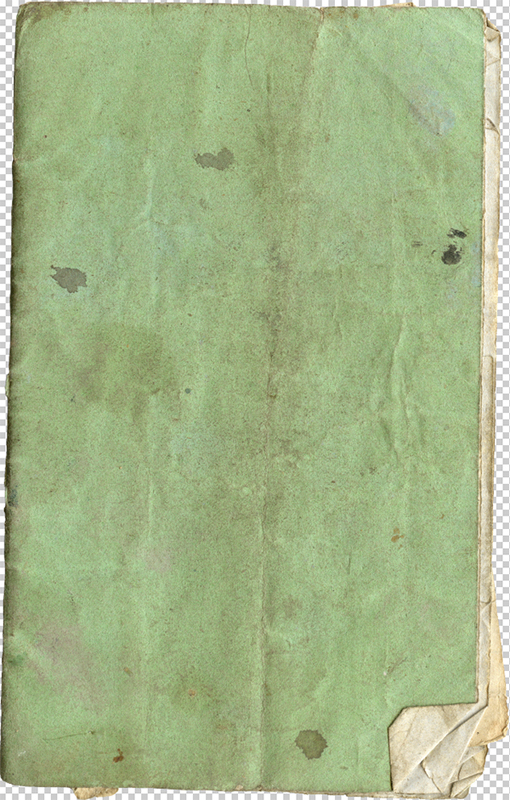 An example of this would be Step 2 import of the Old Notebook texture file. Over the course of the tutorial, many unnecessary steps are repeated for each imported freebie item when there is a quicker and easier method to accomplish the same results listed above. 1. Using Windows Explorer (and guessing the same idea will work from Finder on a Mac)… drag the file from Window Explorer (or Mac’s Finder) into the main Photoshop document window. NOTE: This may result with a bounding Transform box around the new layer object (in case the user wishes to resize the imported object). Also note that holding the Shift key while dragging will center the new object into the destination window. 2. If the Transform bounding box is displayed, press Enter if no resizing is needed (or after resizing has been applied as desired)… and voila… the same result is achieved in one swoop in which a new Smart Object layer is generated with the layer using the source filename as the new layer name. Give it a try and save some steps, typing, and time future work or future tutorials. Thanks so much for your feedback on this one! Oh that’s great news, thank you so much for sharing this! Thanks, this is fun, and im learning a lot. 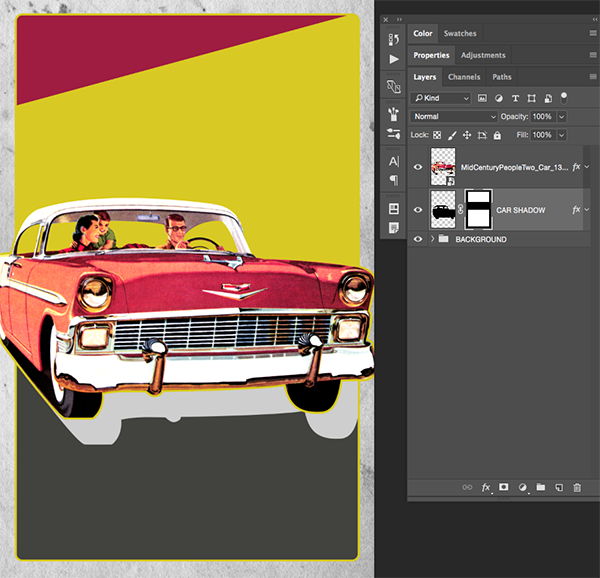 Can you recommend a good tutorial on removing the background for the car? Im havung a hard time of it. Thanks! That’s great news, thank you for letting us know! 1. 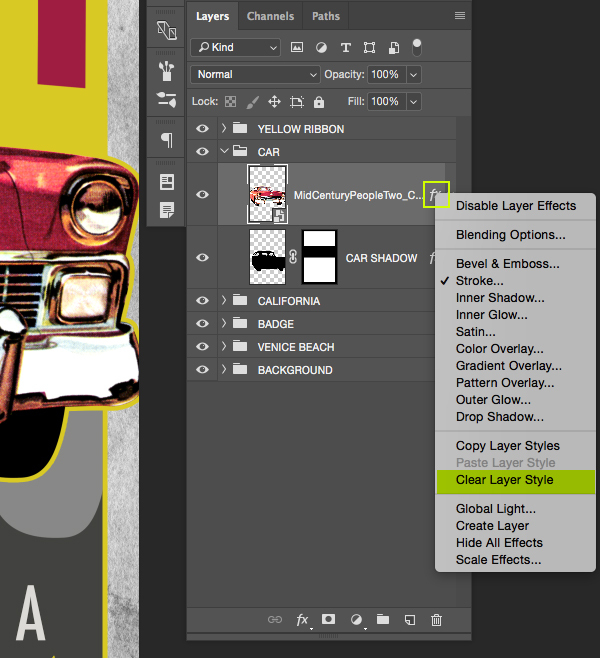 Add a layer mask to the layer. 4. 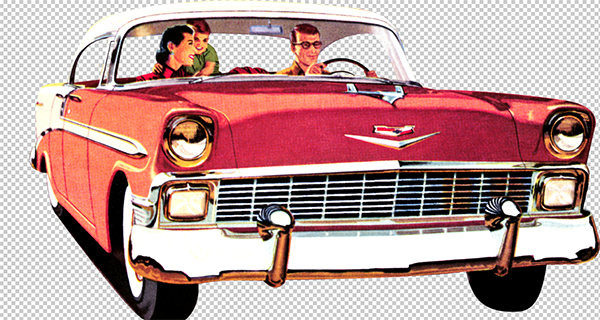 If you make any mistakes, press X to switch white to the foreground, and paint the pixels back in where you want them. Simply press X again to switch back to black as the foreground color and to continue painting to hide pixels (when done correcting mistakes). 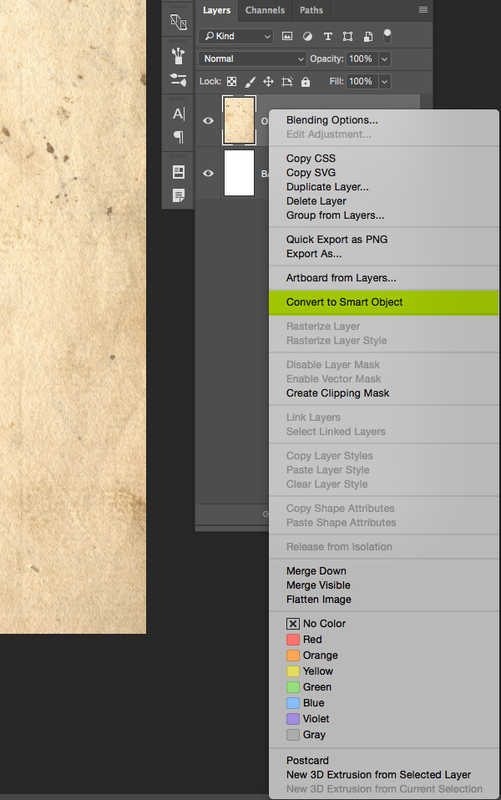 NOTE: Make sure the layer mask icon is active and selected whenever painting or fixing the mask. If the image icon is active and not the mask icon, then you will be painting on the image instead of painting to hide or show pixels. 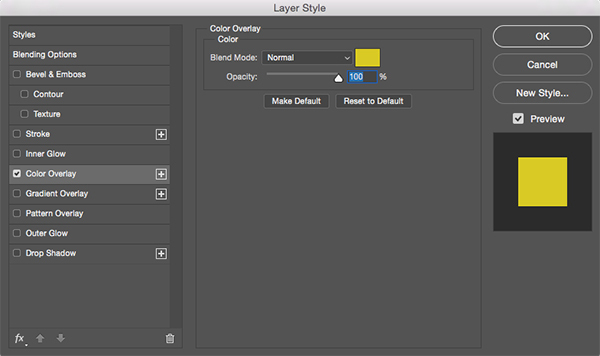 You should see a thin outline around the layer mask icon when it is the active selection on the Layers Panel. 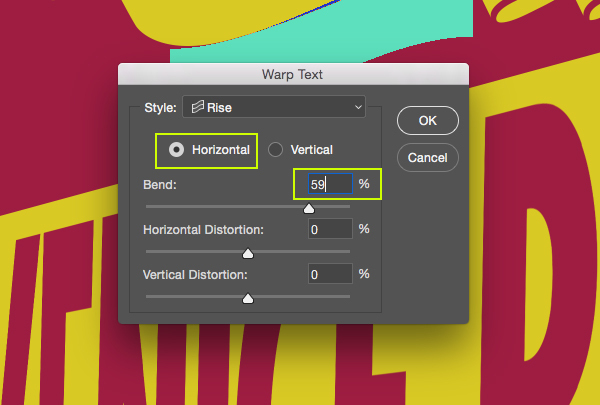 It might be useful to also know that when painting around the border of the object, I like to use a small 5 px brush with 50% hardness for precision around the edges of the desired object. 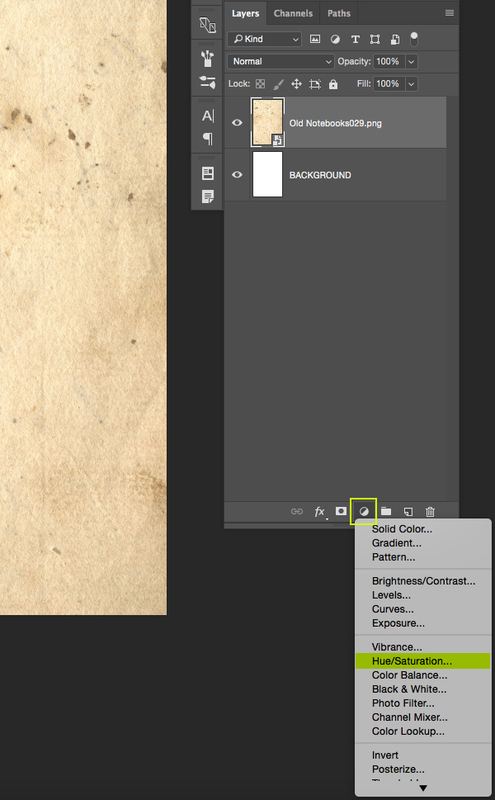 When the brush tool is active, simply right-click anywhere on the canvas to get quick access to brush settings, and be sure to press Enter to dismiss the settings dialog box (when finished adjusting the settings). The bracket keys on the keyboard can be used to increase or decrease the brush size quickly. Left bracket key [ to decrease and right bracket key ] to increase. 1. 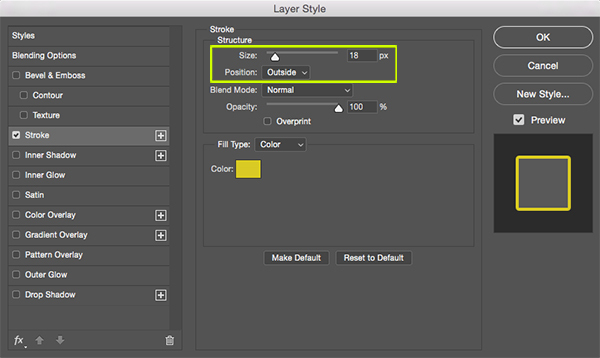 First make sure that the image layer on the Layers Panel is not a locked Background layer. 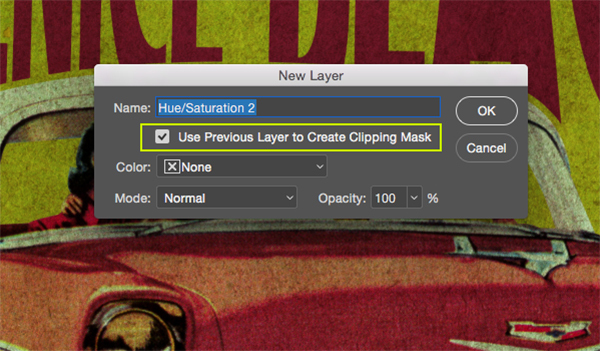 Do this by double-clicking on the layer and renaming the layer or accept the default “Layer 0” name in the Layers Properties dialog box and click OK.
2. You may also wish to keep a copy of the original layer, so press Ctrl+J to duplicate the layer and turn off the visibility of the bottom original copy. 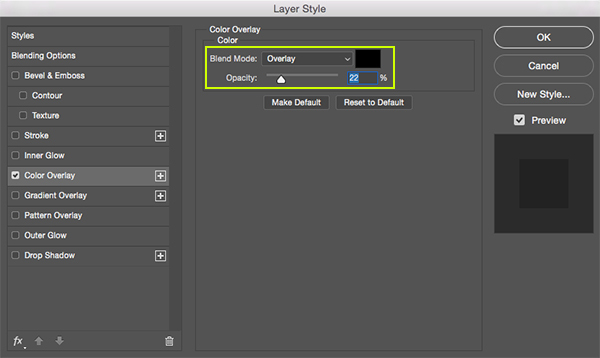 But make sure the top copy is the selected active layer. 3. Now you can simply toggle Quick Mask on or off by pressing “Q” on the keyboard — or alternately click the Quick Mask icon as needed to toggle in or out of Quick Mask. 4. 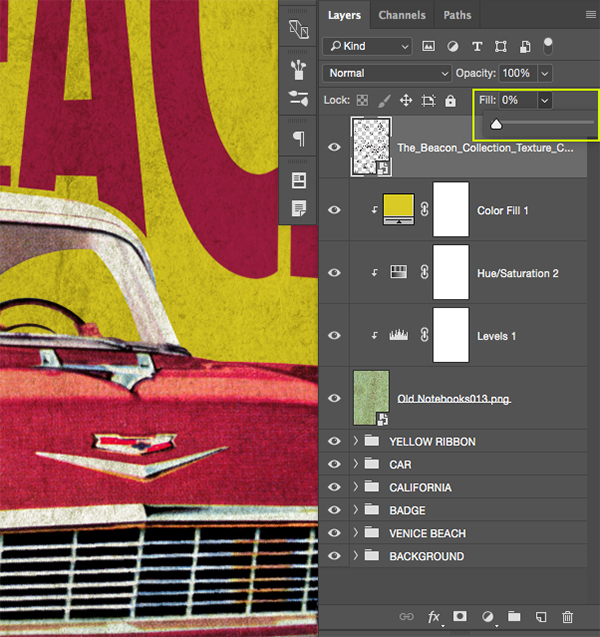 When Quick Mask is on, use the same principles as described in the first method above — by using the Brush tool, in which you paint with black to add the red overlay color to the desired areas you wish to remove, paint with white if you make a mistake and wish to remove the overlay color (while in Quick Mask). Recall, that if needed, press D for default colors of black and white. 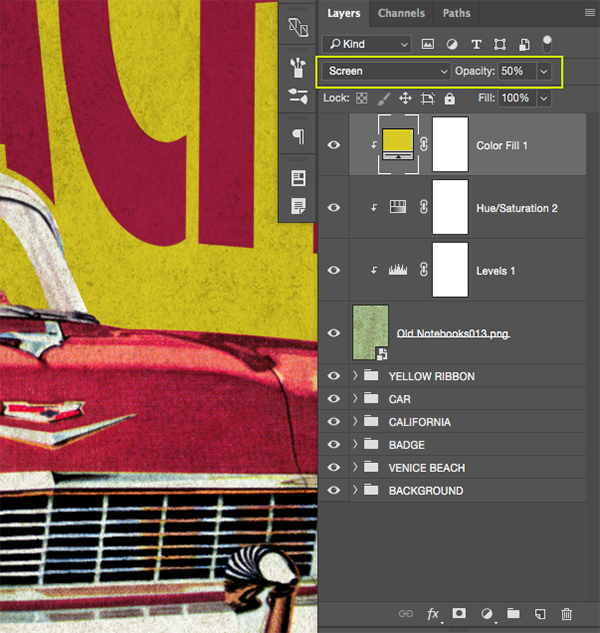 Press X to toggle the black and white colors between foreground and background as needed. Again I would recommend the small 5 px brush with 50% hardness when painting close to the border edges (and would paint around all the border areas first). Then fill in the bigger areas later. Red color overlay will display over any of the areas you paint. 5. When finished painting over the background, press Q to exit Quick Mask and the overlay color areas will become a selection (with the marching ants selection seen surrounding the desired area previously painted). 6. Simply press the backspace key to delete this area that is selected. Quick Mask has a nice benefit of giving that visual color overlay feedback to see what you are painting… I actually have a quick method for painting in the large areas… but the above information may be enough to digest for now. Thanks so much for sharing this Mara!